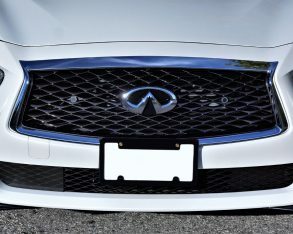 Sometimes subtle changes make all the difference. 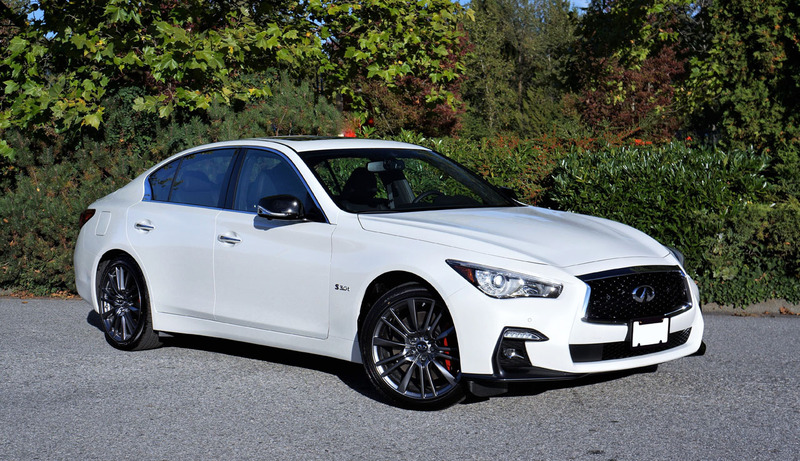 Not that the outgoing Q50 was unattractive. 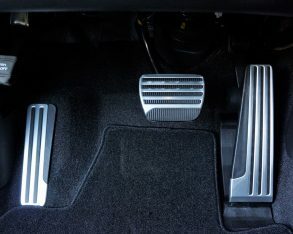 In fact it was just the opposite. 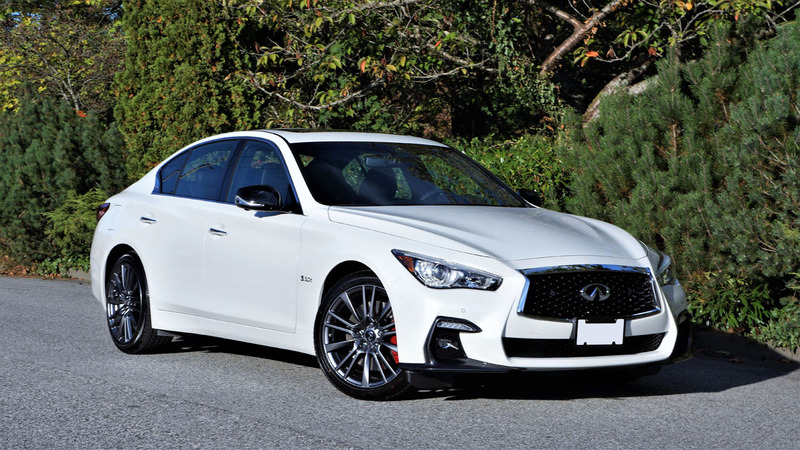 I’d say it was one of the more aesthetically pleasing cars in its class, but this refreshed 2018 model adds just the right amount of spice to styling that was starting to lose its savour. 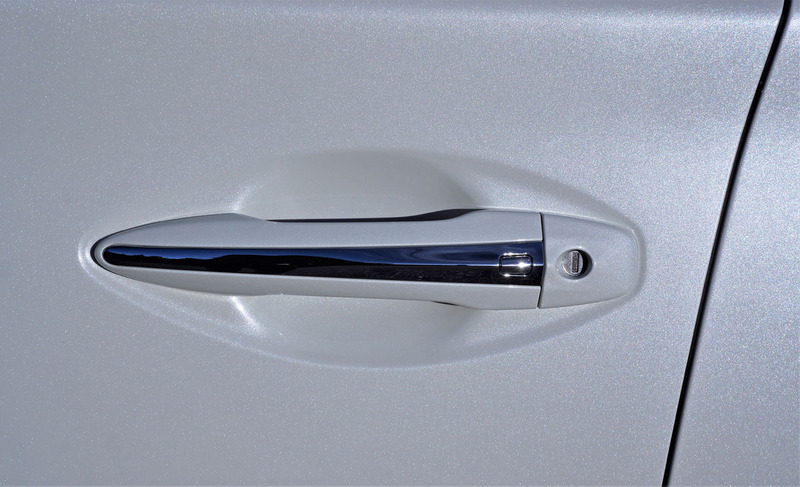 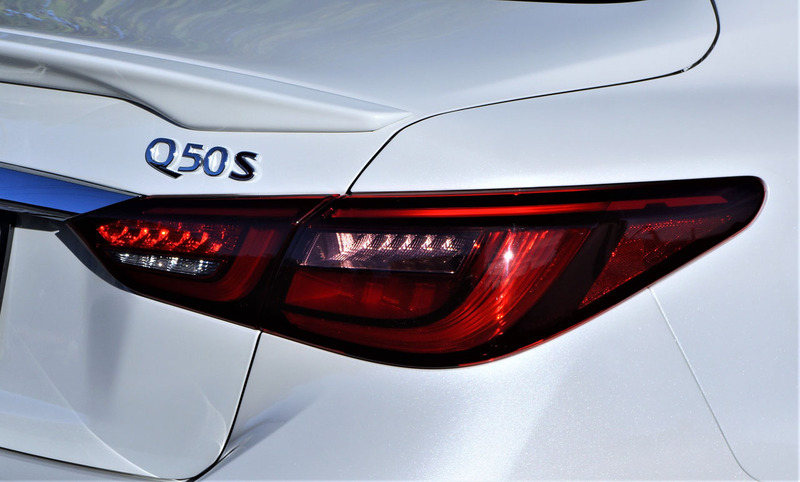 Even the best designs do, and the old Q50 wasn’t about to wear out its welcome. 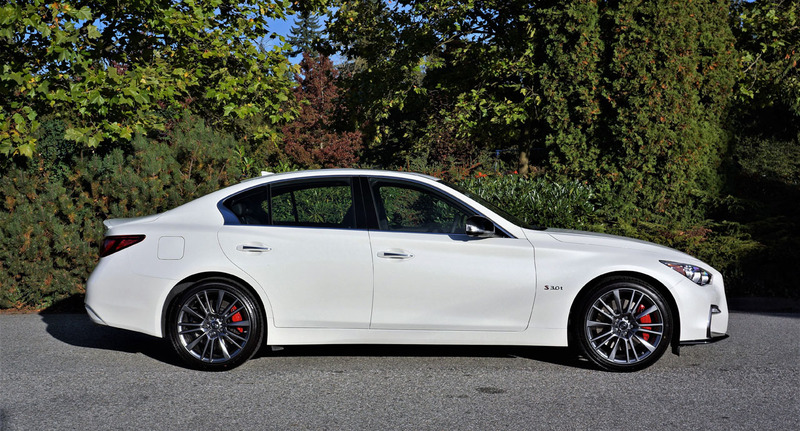 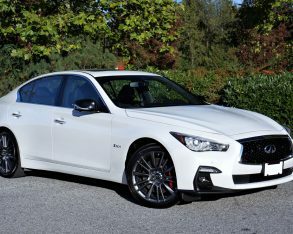 The outgoing Q50 first arrived in 2013 as a 2014 model. 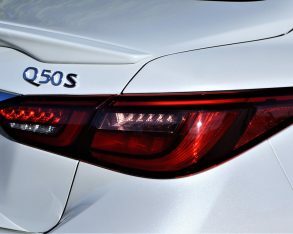 Four years is hardly long-lived for a premium model, not even coming close to the brand’s QX50, which when replaced next year will have been soldiering along with only minor updates for 11 years, but changes to the 2018 Q50 weren’t anywhere near as dramatic. 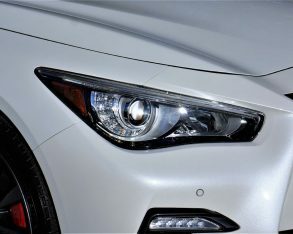 more muscular character lines now follow the upper outside corners of that grille across each side of the hood. 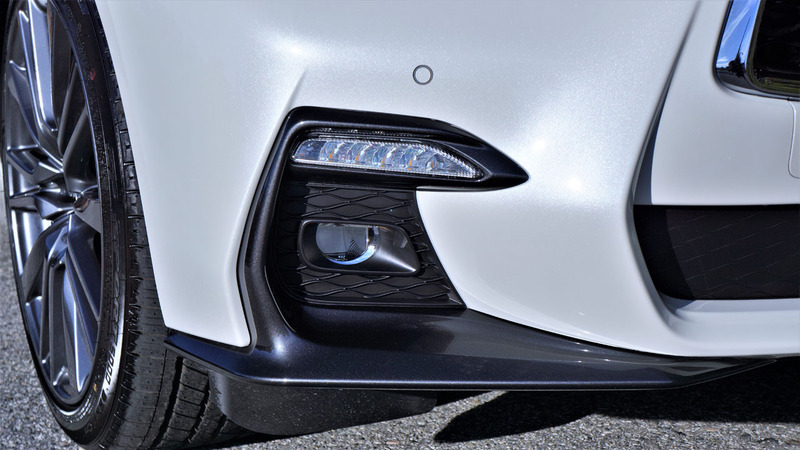 These changes were joined by revised headlamps, featuring standard LEDs for more cat’s eye-like illumination, and redesigned LED taillights at the car’s polar end. 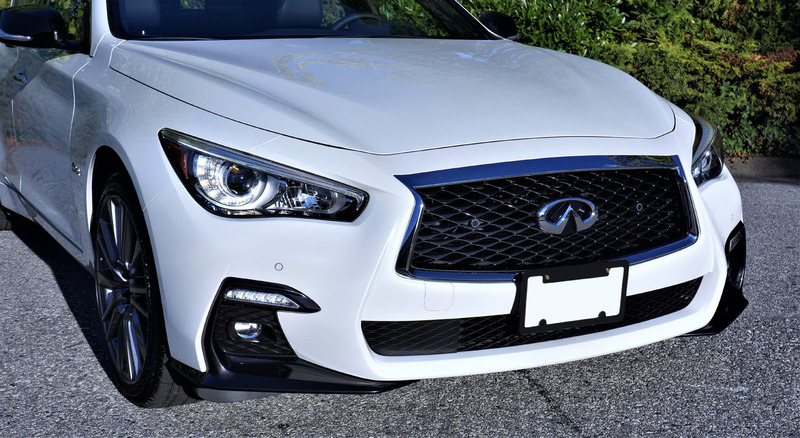 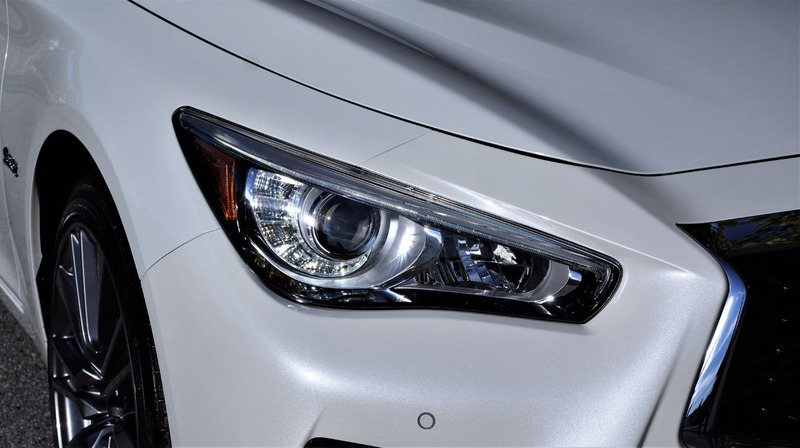 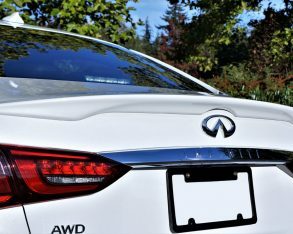 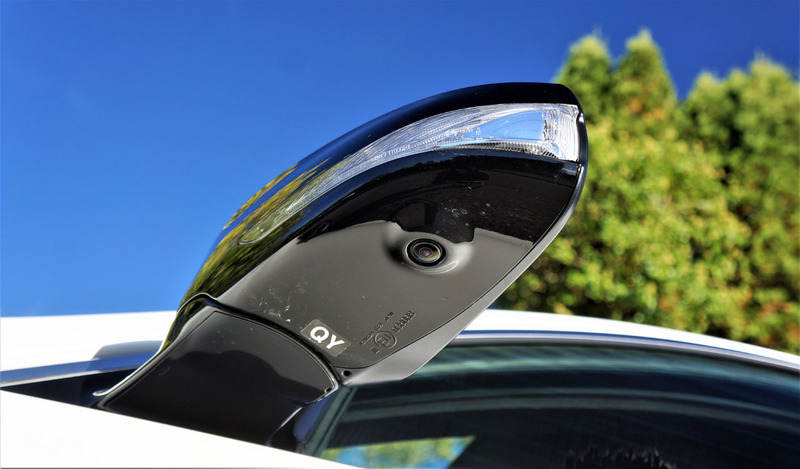 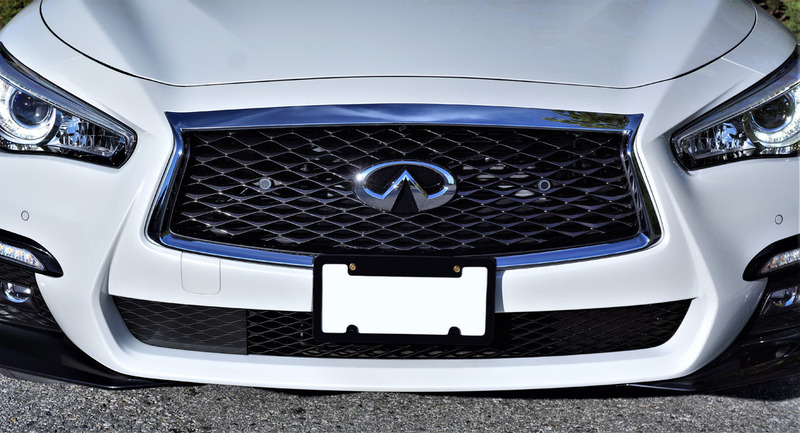 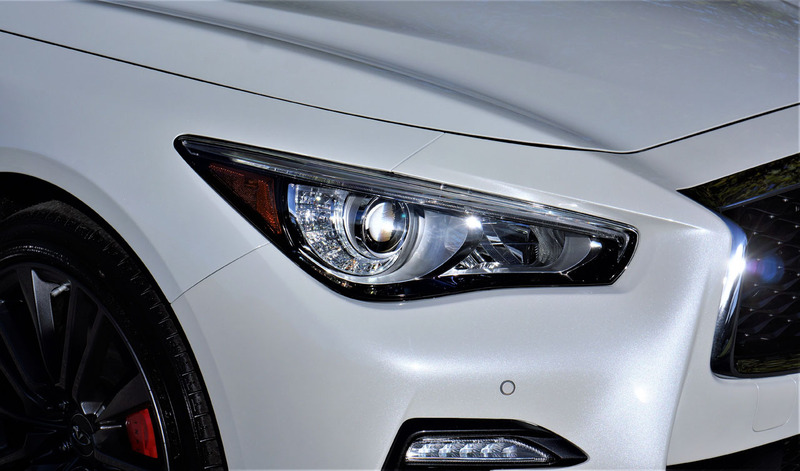 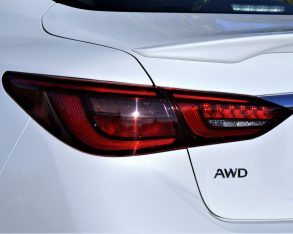 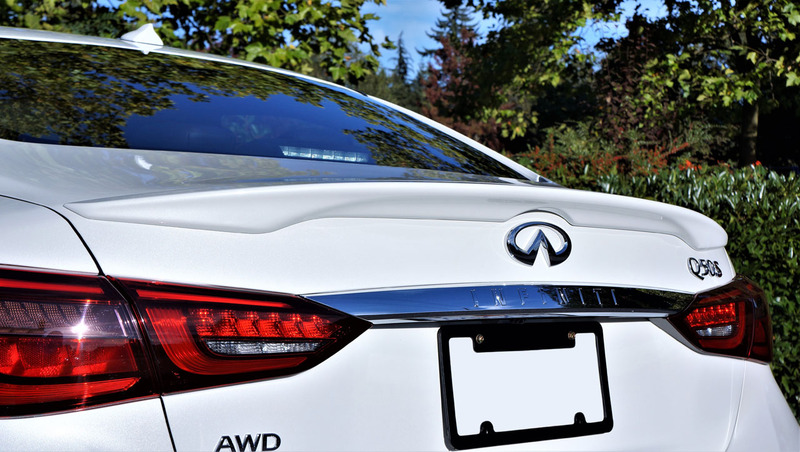 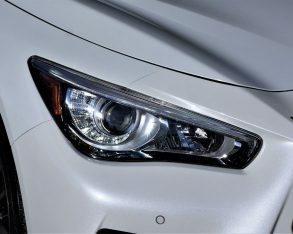 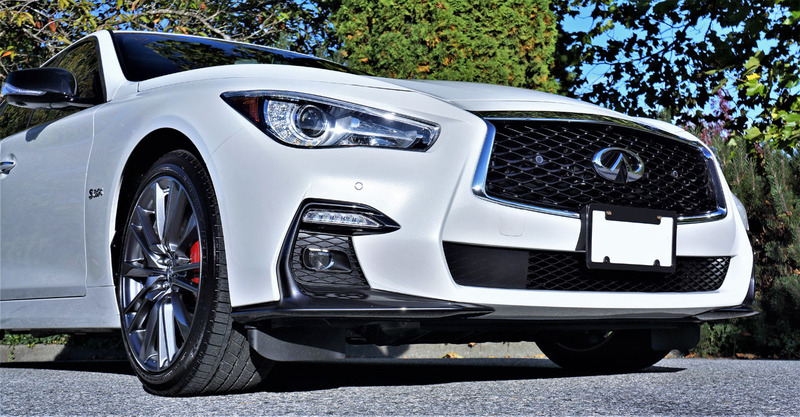 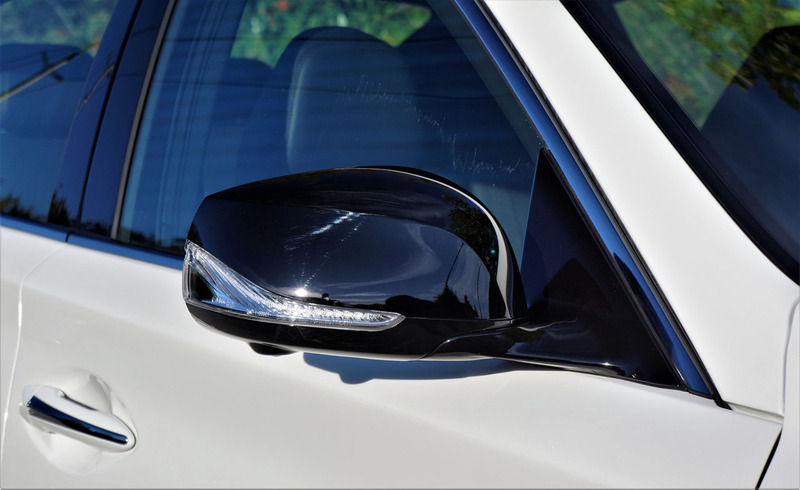 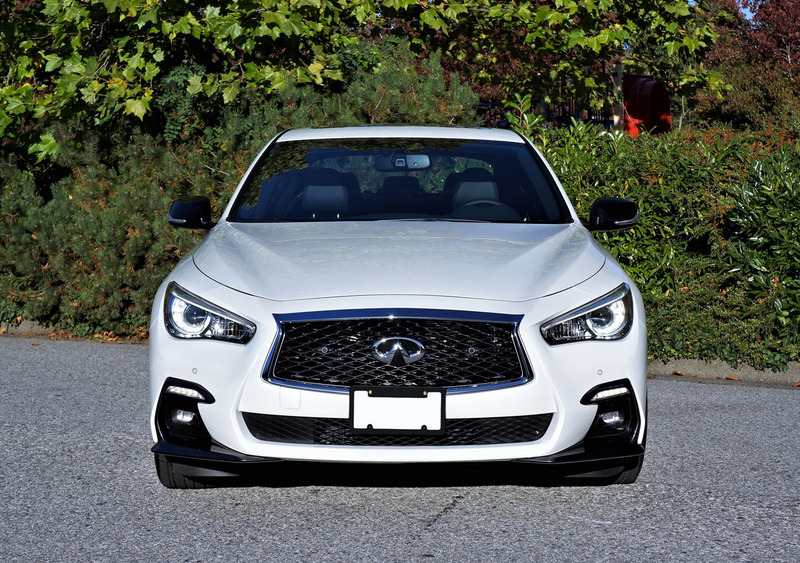 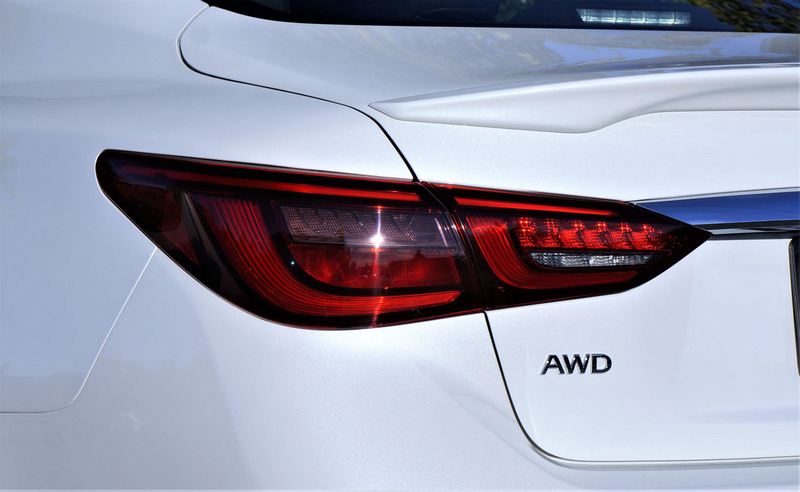 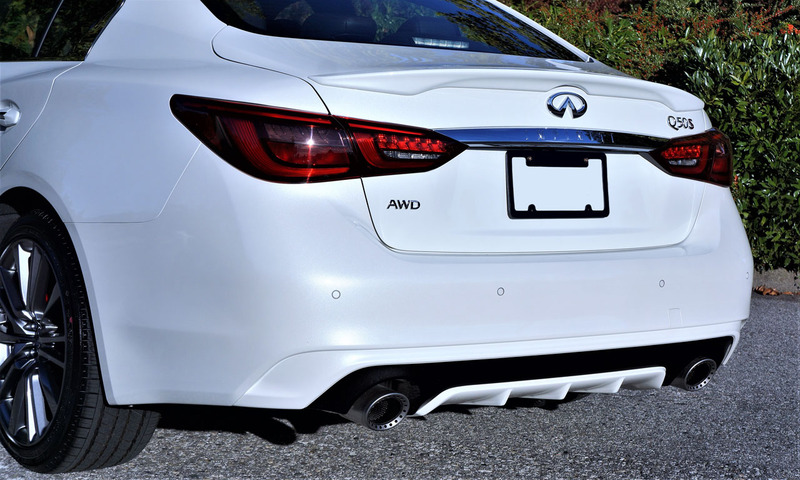 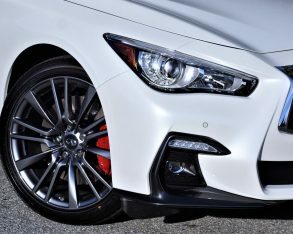 While all these updates help modernize the Q50’s look, the new model’s most noticeable changes were saved for its lower front fascia, which now more clearly depicts the trim line, or rather “grade structure” being shown. 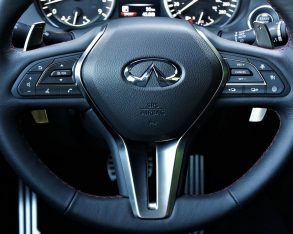 latter two “grades” will be familiar to those who follow Infiniti’s products, although Infiniti has never used Luxe before. 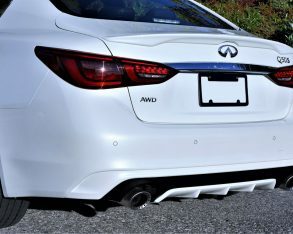 Let’s be first to congratulate them for not including Limited or Platinum in their naming scheme, two of the most overused trim designations in the industry, not to mention kudos for dropping the similarly derivative Premium designation, after which we should give the brand a collective nod of approval for visually separating each trim line to benefit those paying more to move up into a higher-end model. 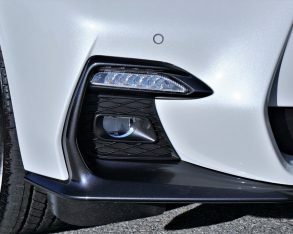 grades include a more sharply creased front bumper and wider, lower air intakes, the corner vents edged in glossy black that’s particularly easy to pick out in my tester’s Pure White paint, while the rear bumper gets a bolder black diffuser embedded at centre, with a stainless steel exhaust tip at each corner. 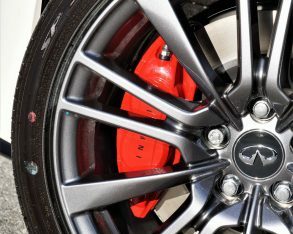 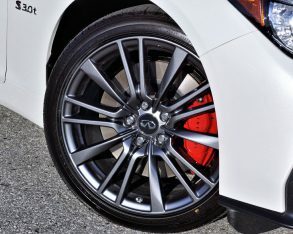 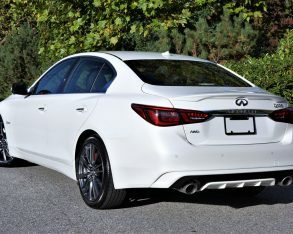 The Red Sport 400 takes things up a notch with unique tailpipes flanking a glossy dark painted and body-color diffuser, while the side mirror caps also get a gloss black treatment, plus a unique set of 19-inch alloys framing red-painted brake calipers to finish off the track-ready look. 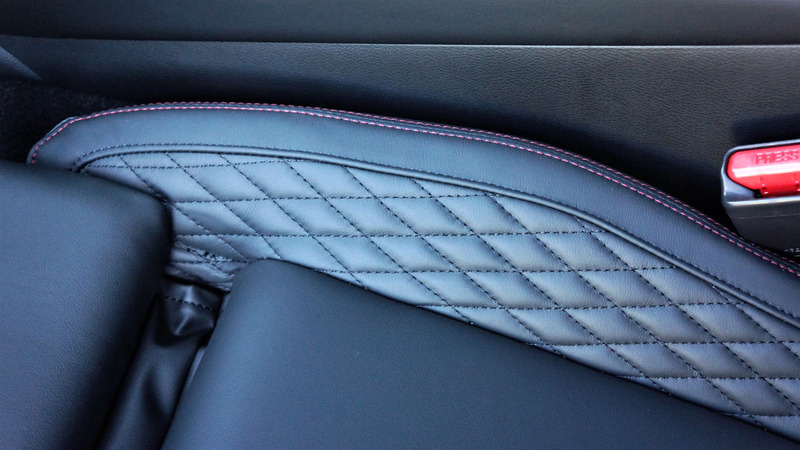 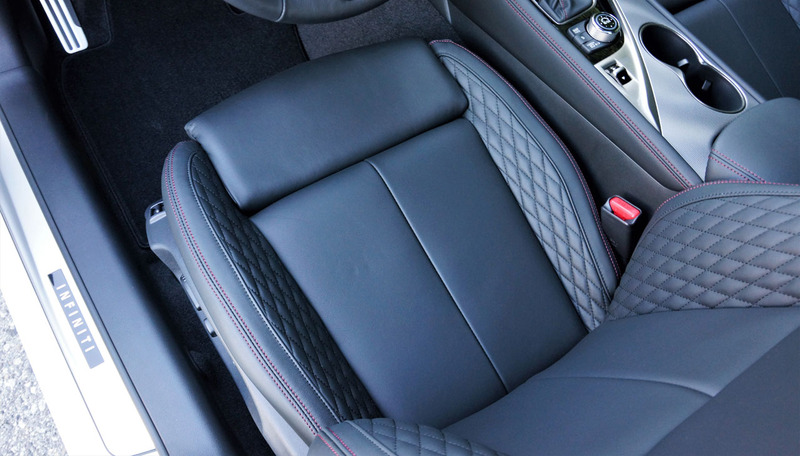 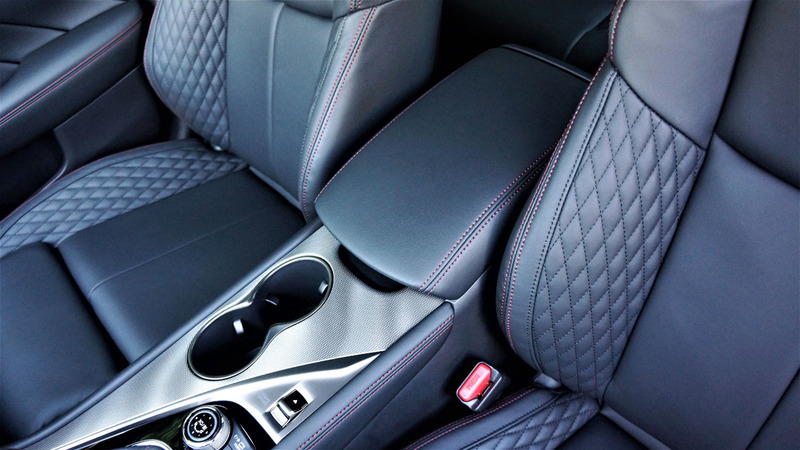 quilting and red stitching, giving the car a rich ambience. 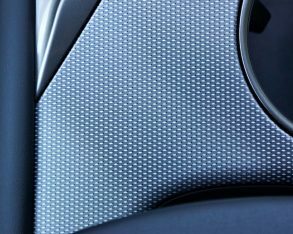 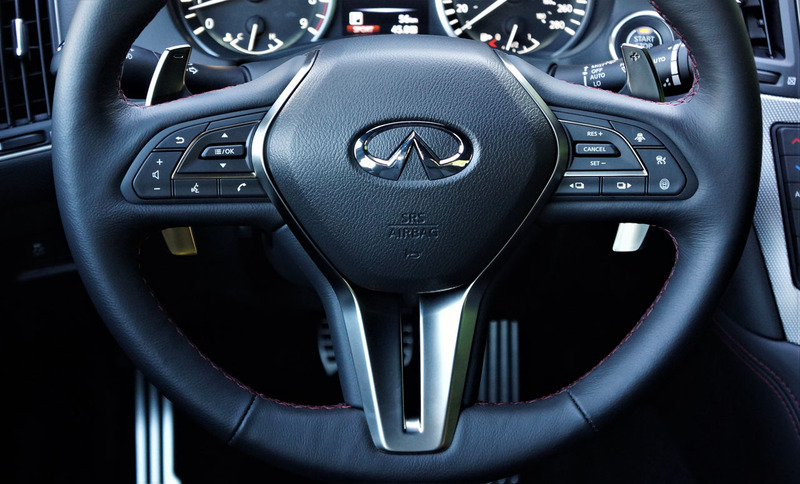 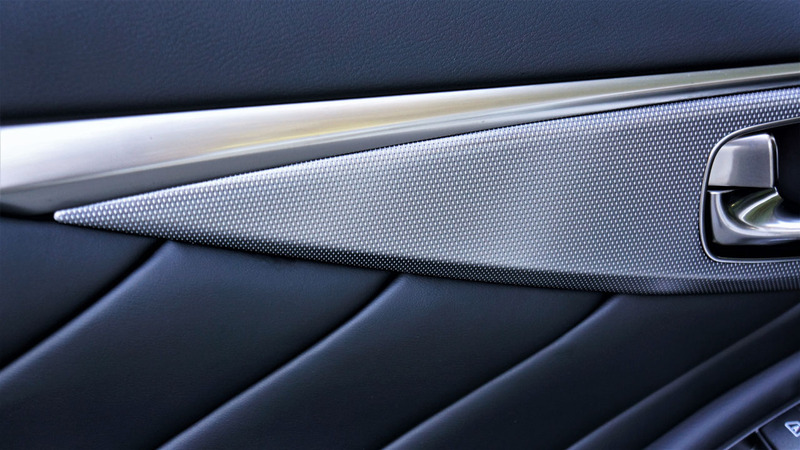 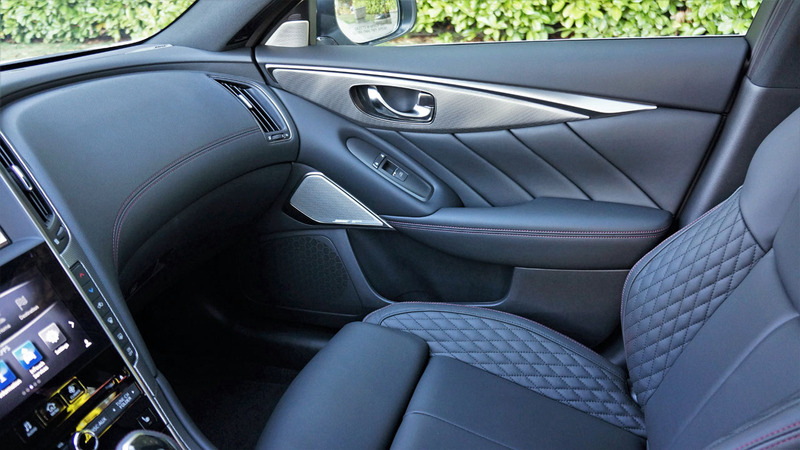 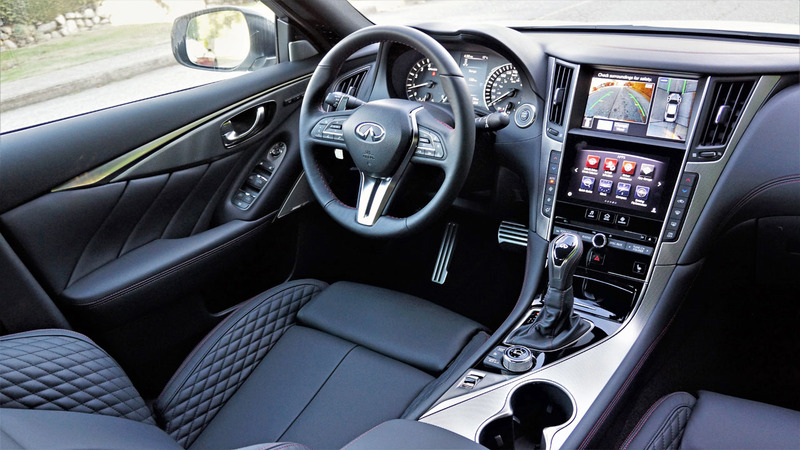 What’s more, every Q50 covers the instrument panel with double-stitched padded leatherette, while more traditional luxury-oriented models get naturally authentic hardwood inlays. 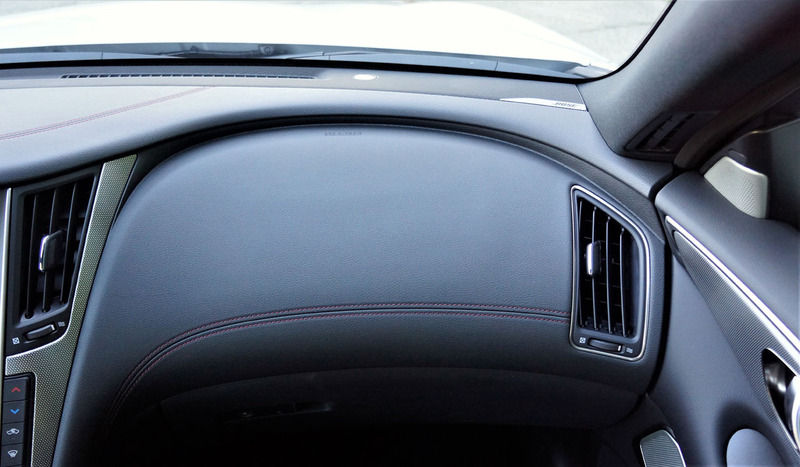 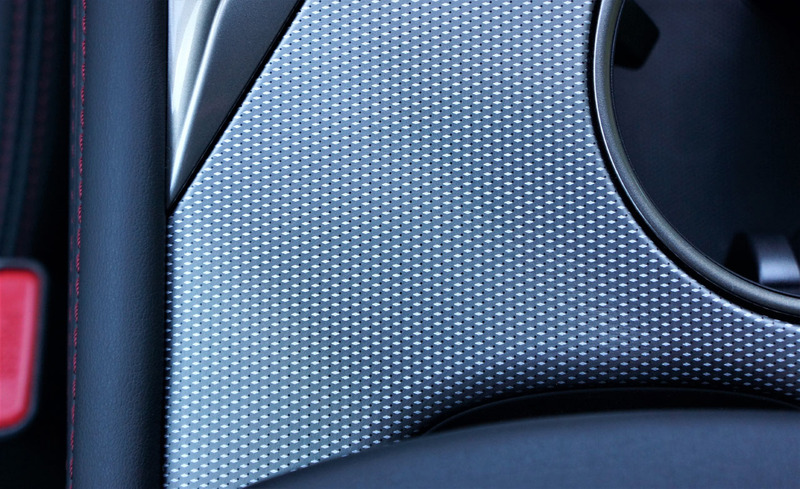 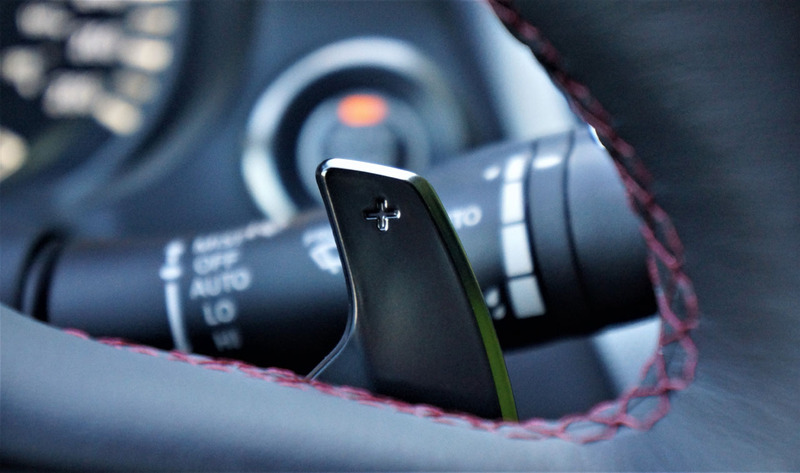 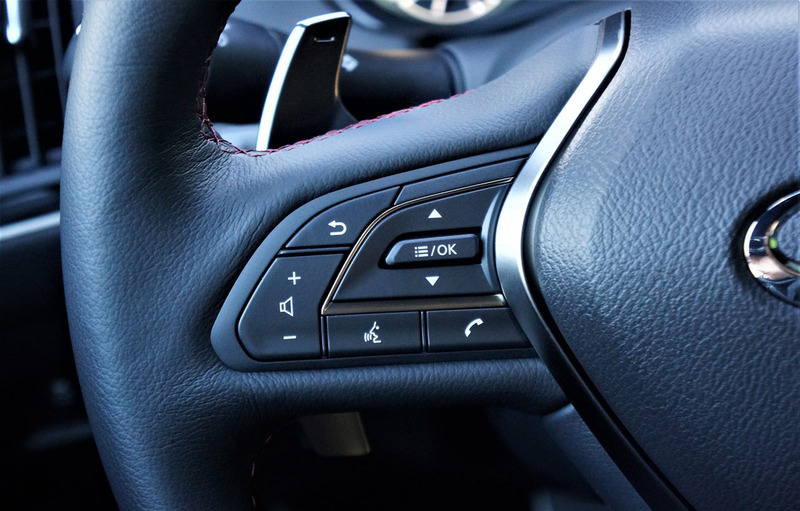 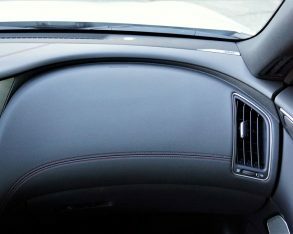 The patterned aluminum inlays on my Red Sport 400 tester also bling up the Sport model’s interior, as do matte dark-chromed accents plus a black cloth headliner and pillars, while the new sport steering wheel is ideally formed for performance driving, allowing an easy reach to the solid magnesium shift paddles in behind. 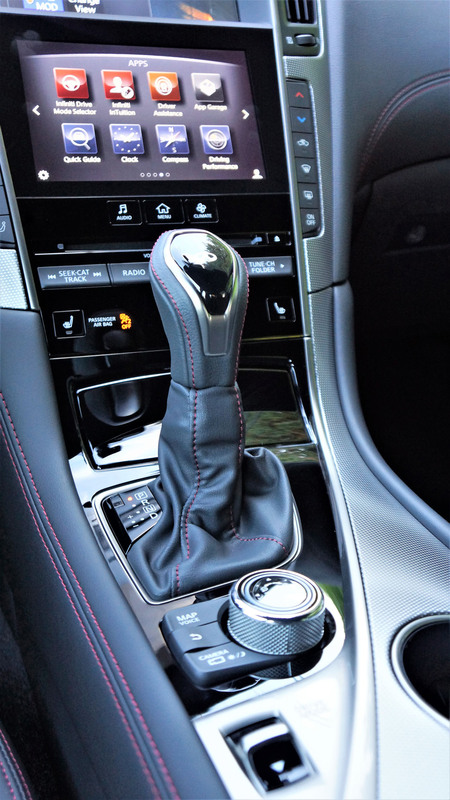 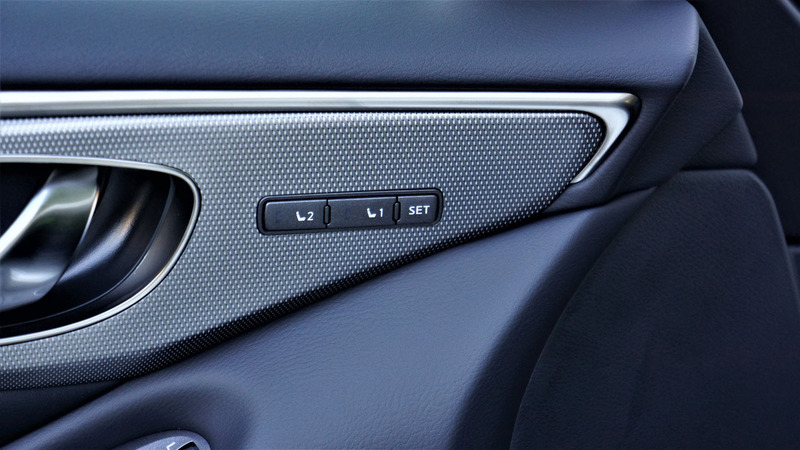 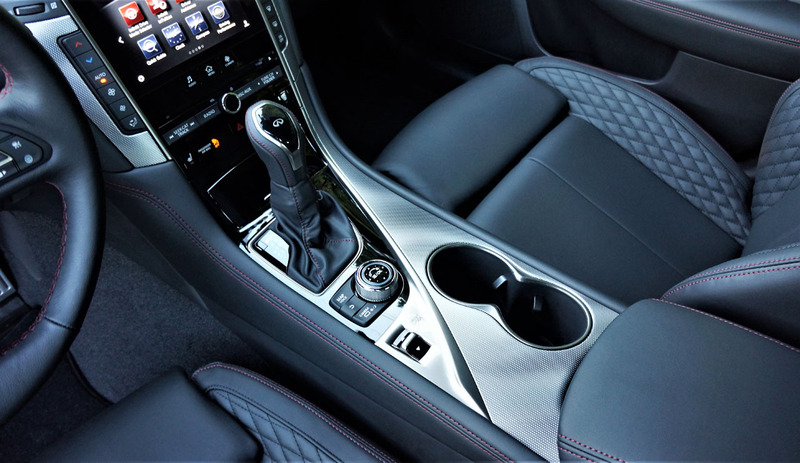 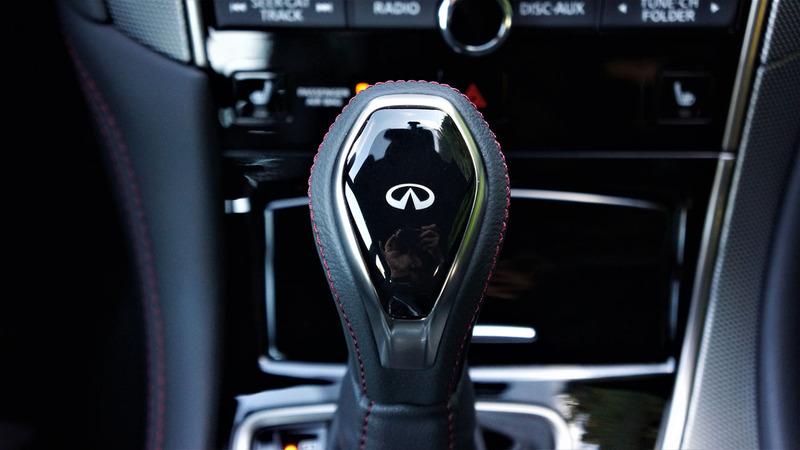 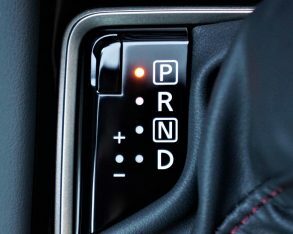 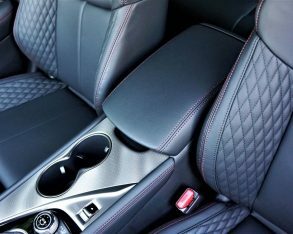 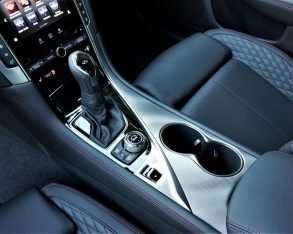 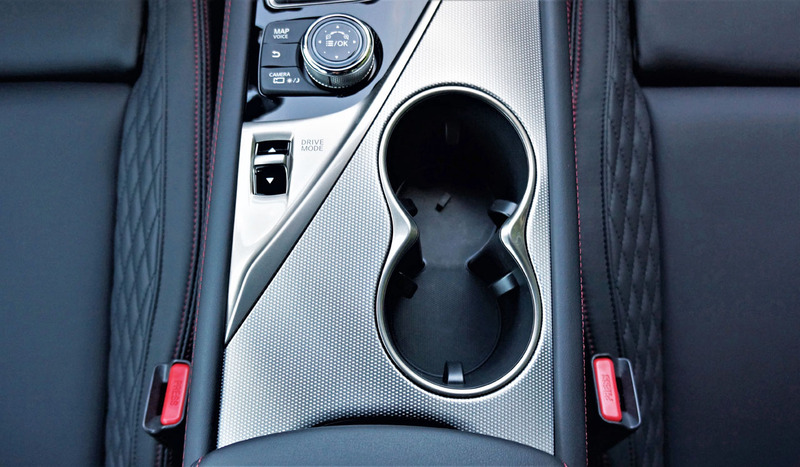 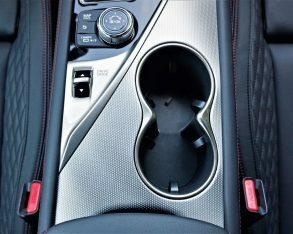 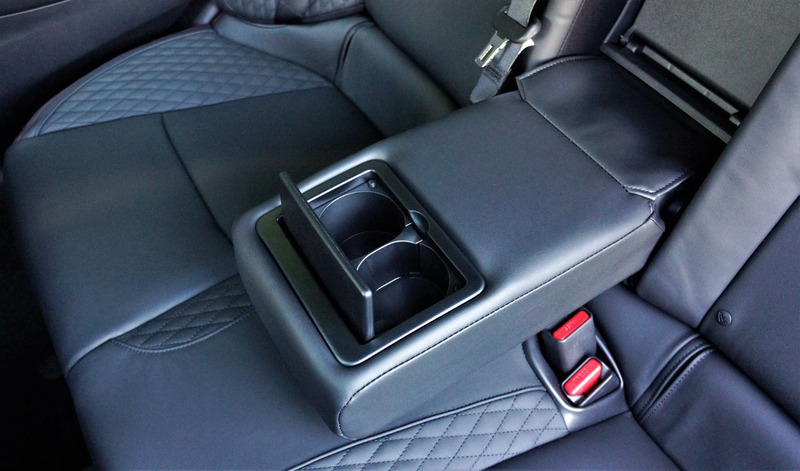 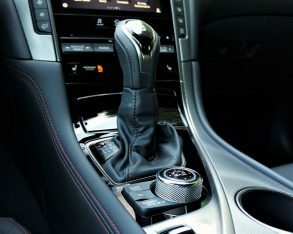 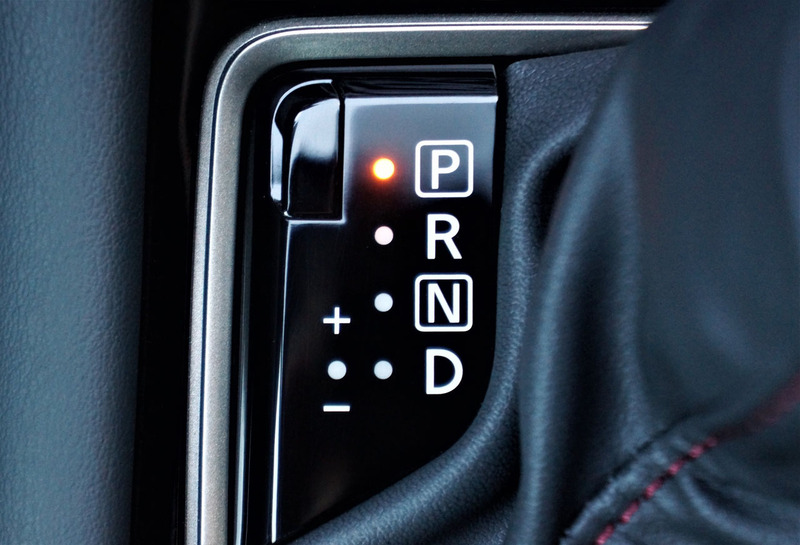 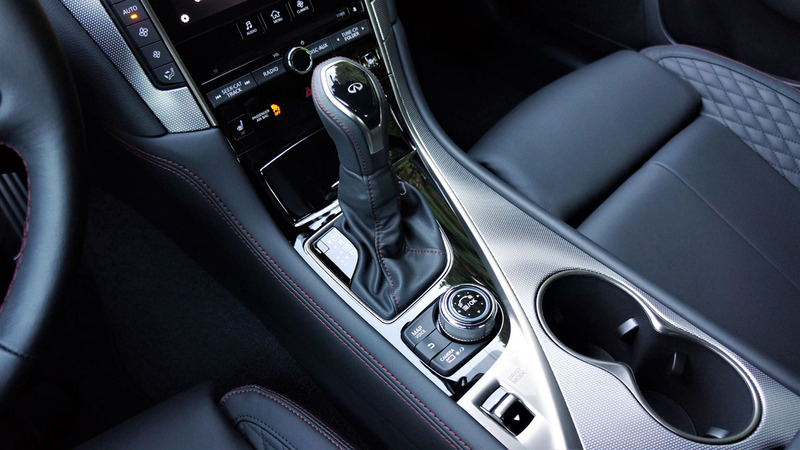 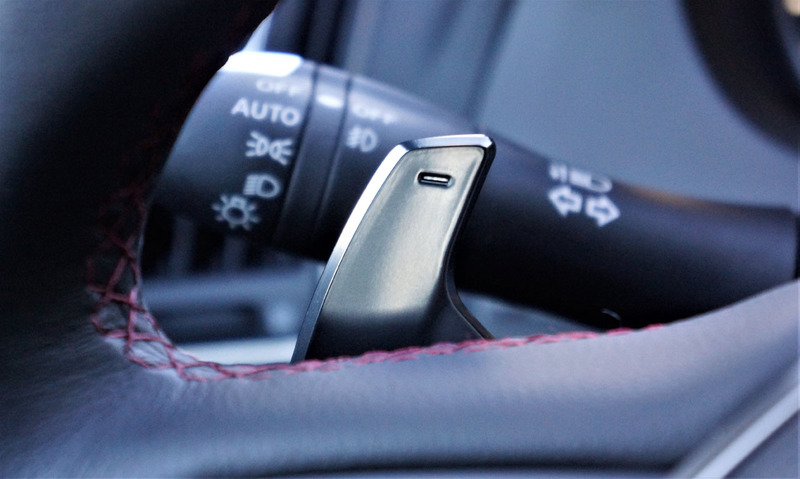 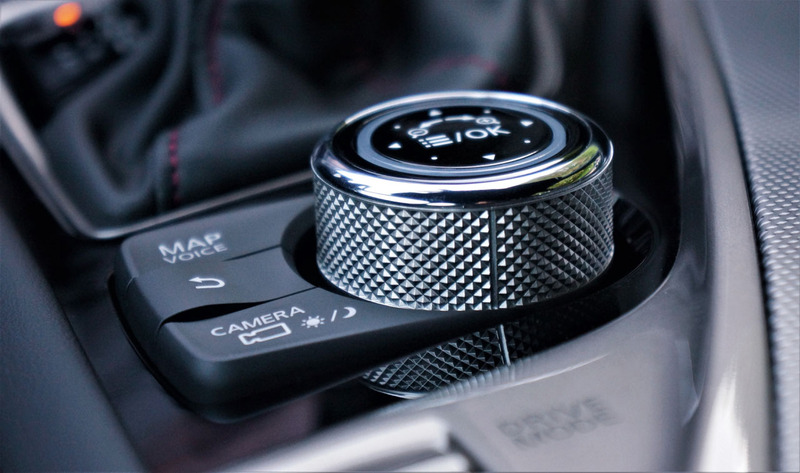 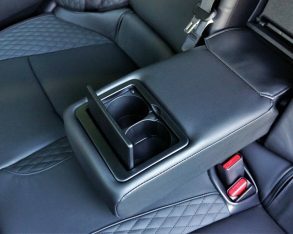 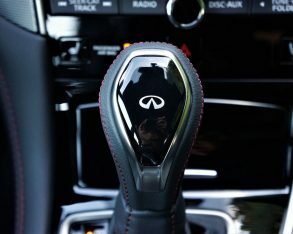 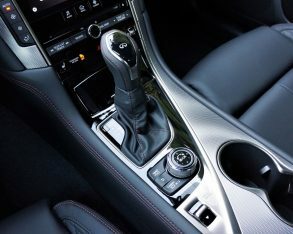 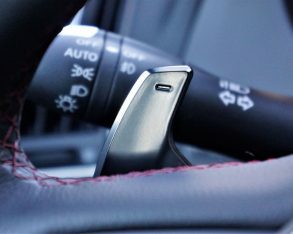 The new leather-wrapped shift knob has been ergonomically designed as well, enhanced with double-stitched seams, new chrome trim, and an Infiniti logo on top. 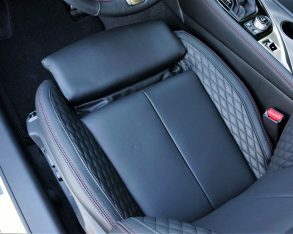 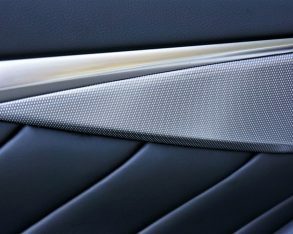 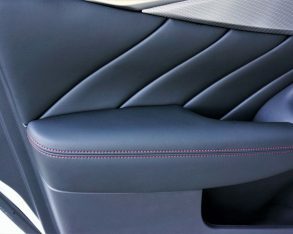 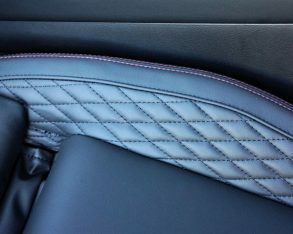 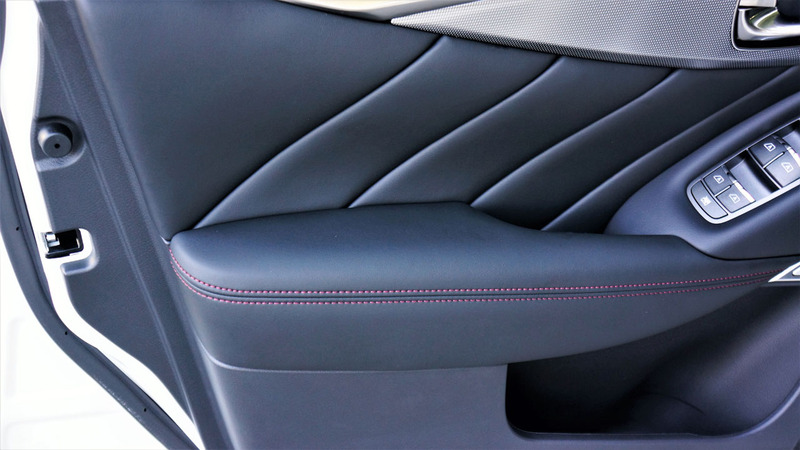 didn’t hold back with the red stitching effect throughout the rest of the Red Sport 400’s cabin either, but at least they didn’t go so far as to brighten up the stitching within each and every diamond-quilted crevice of its Bentley-esque seats’ side inserts, the result looking rich yet nicely restrained. 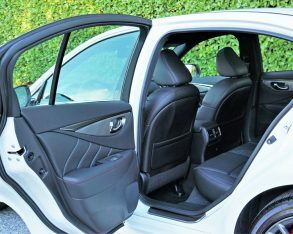 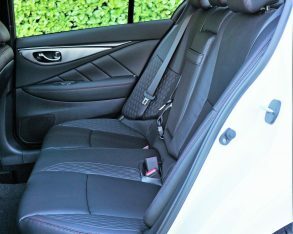 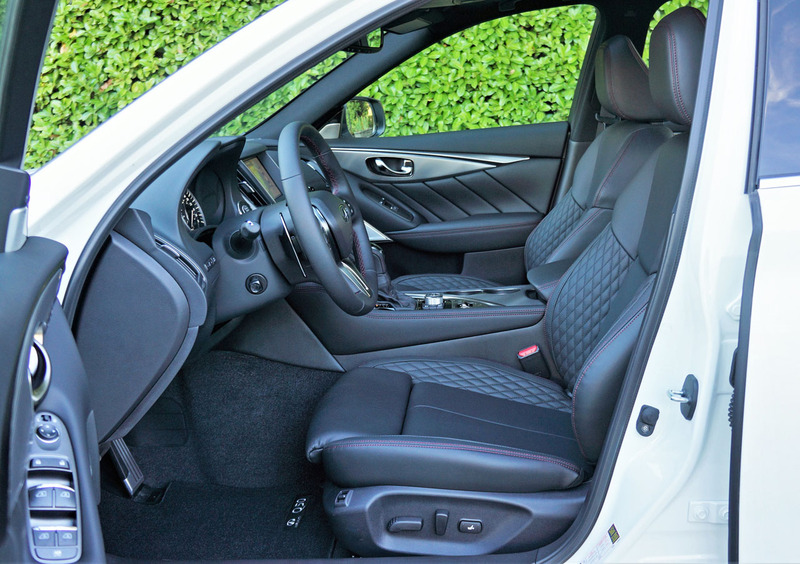 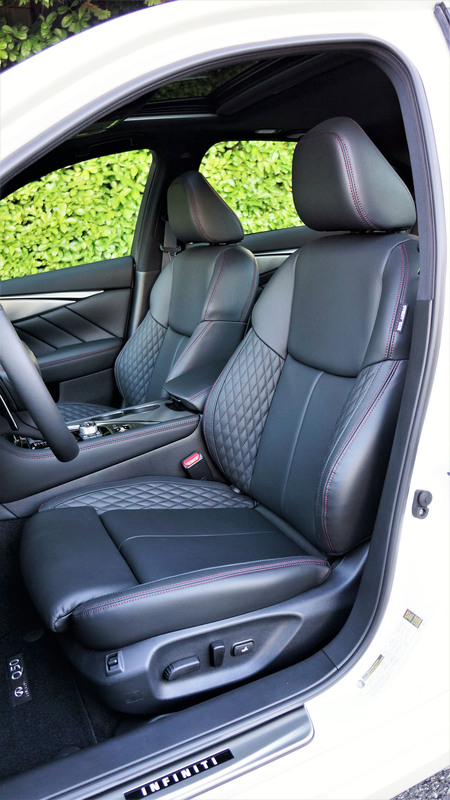 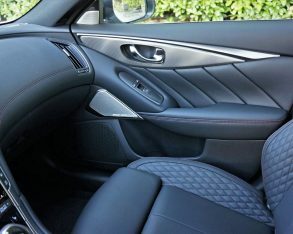 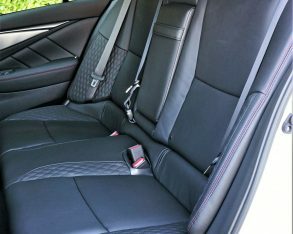 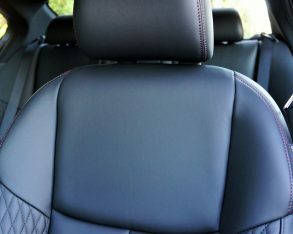 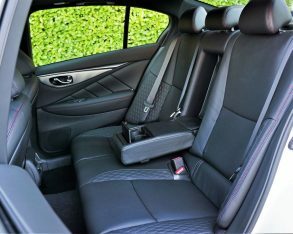 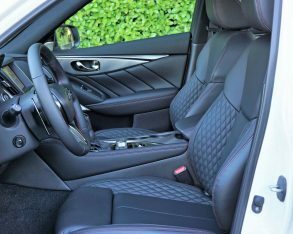 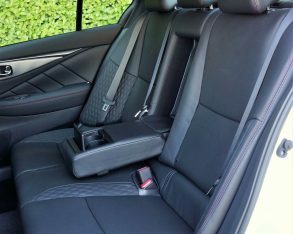 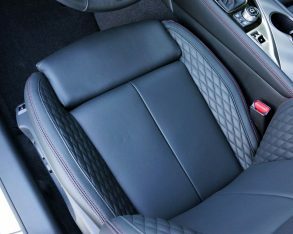 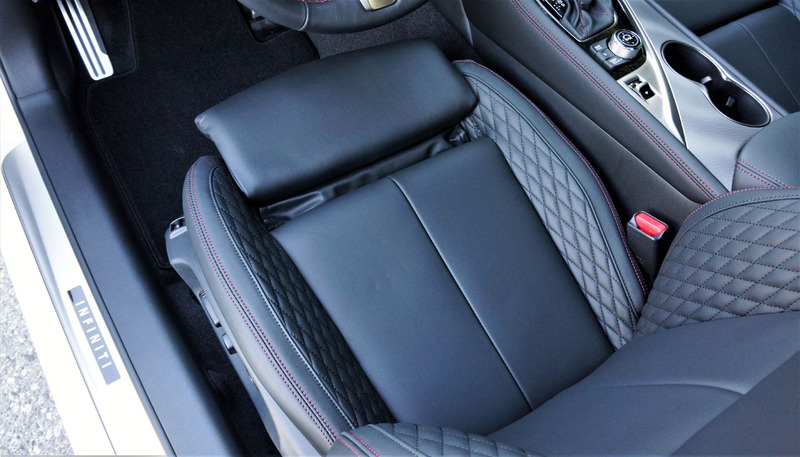 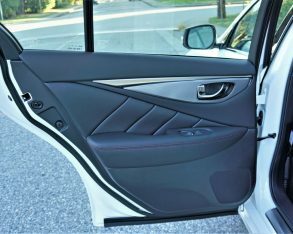 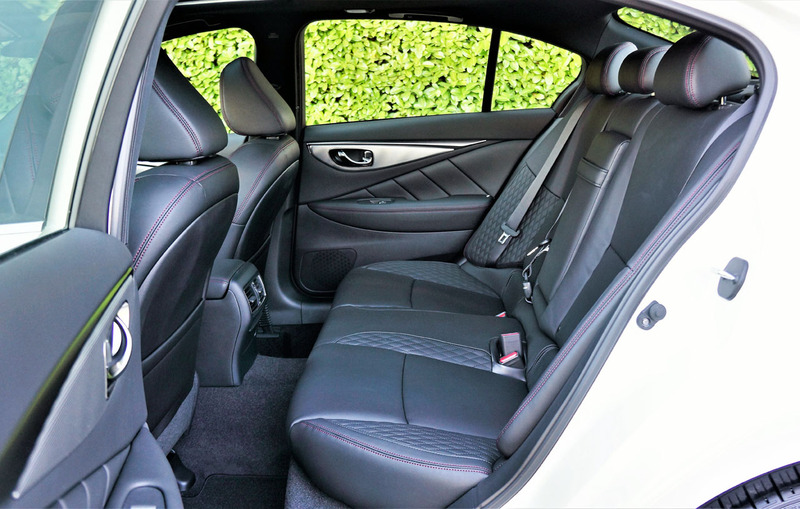 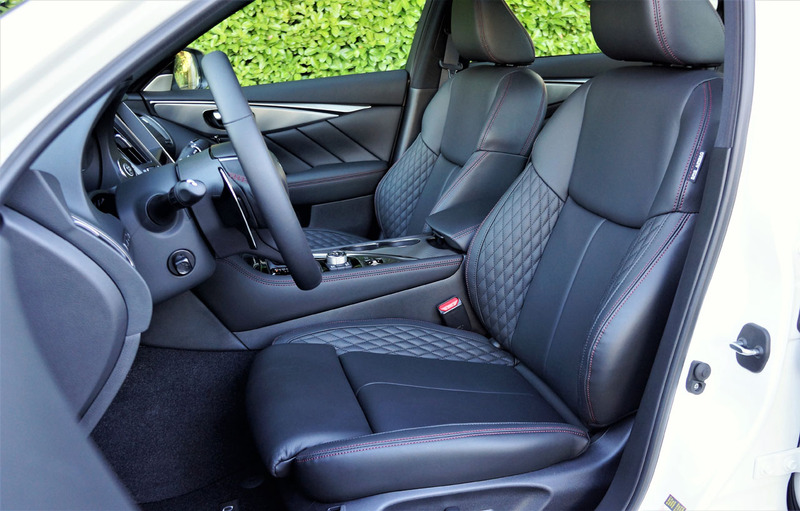 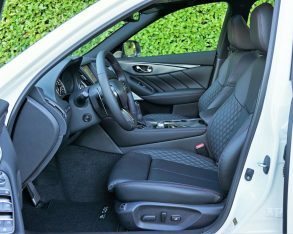 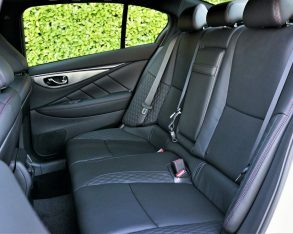 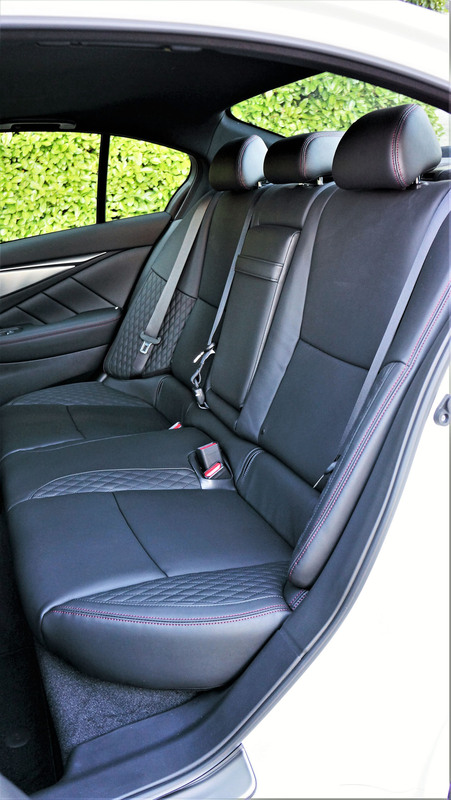 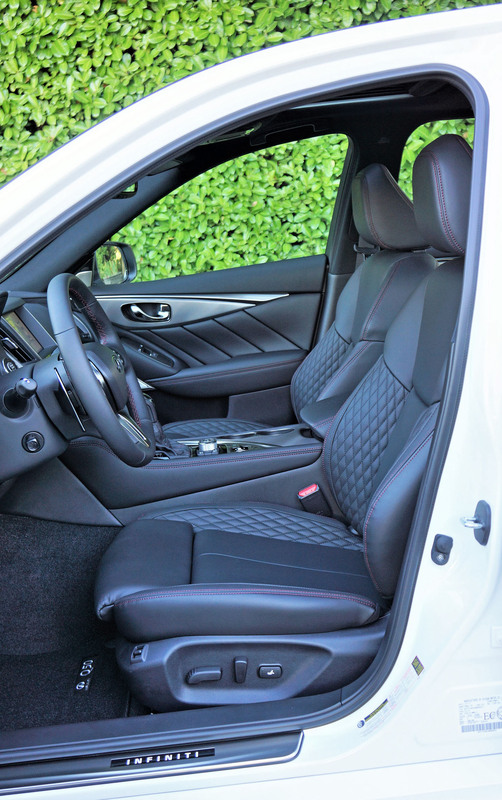 As importantly those seats include a more comfortable “spinal support” design that can be felt initially when sitting down and more so after a long stint behind the wheel. 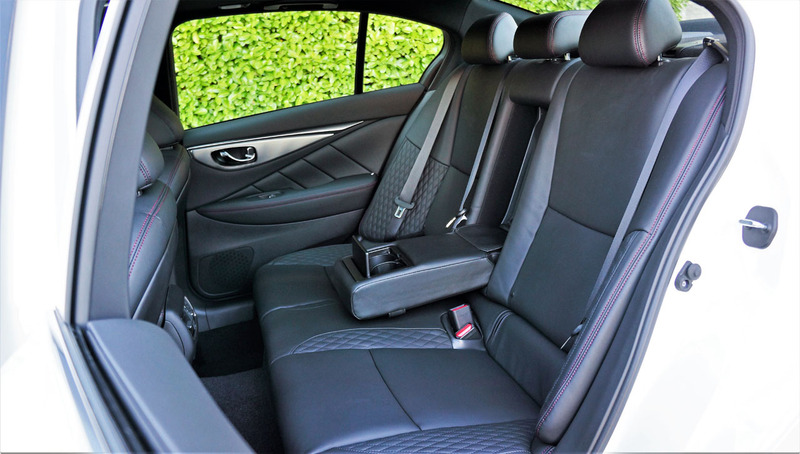 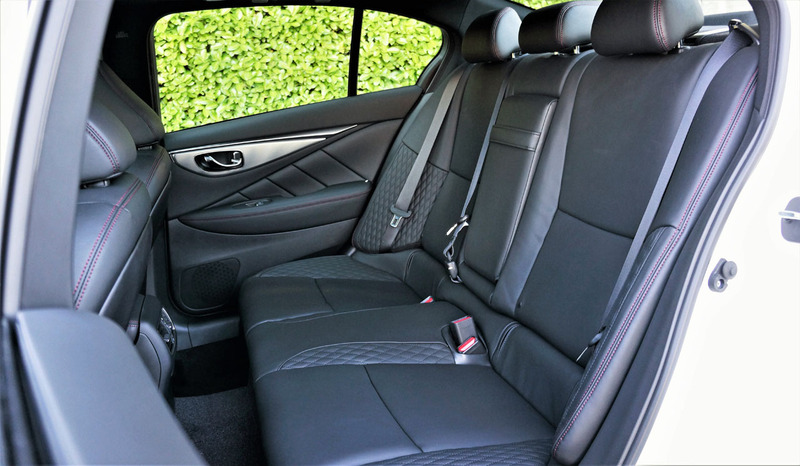 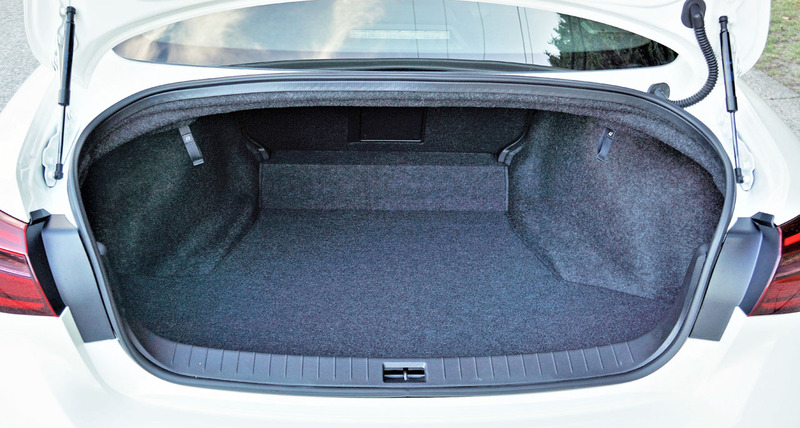 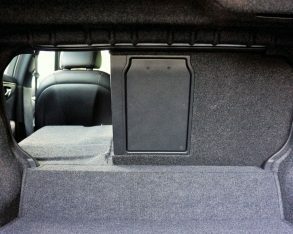 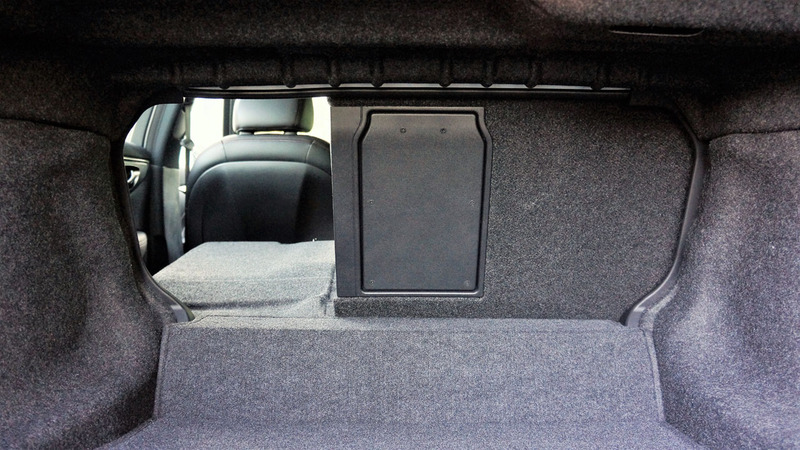 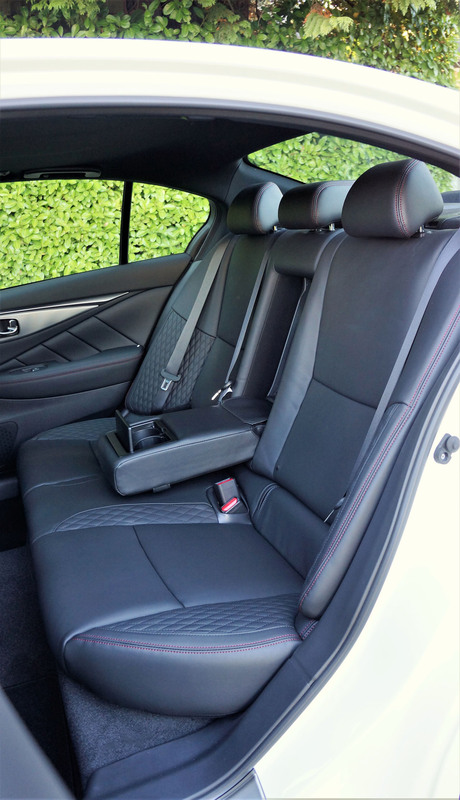 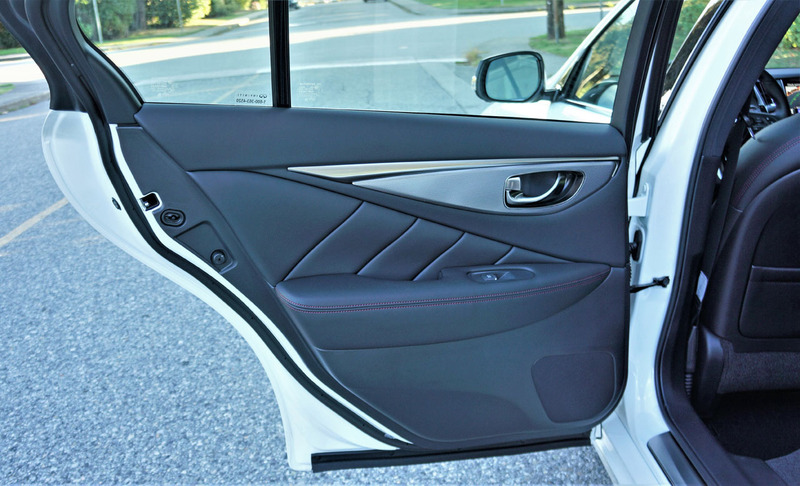 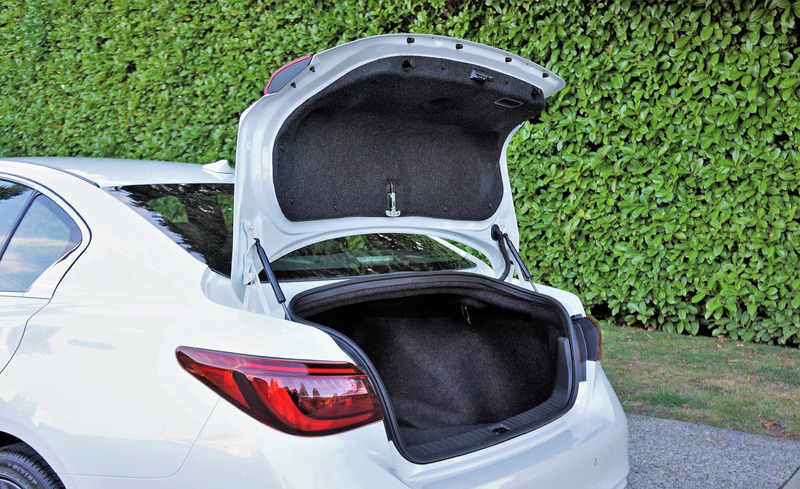 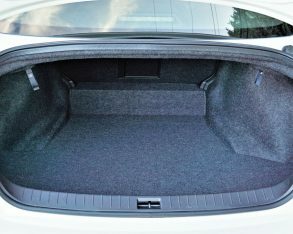 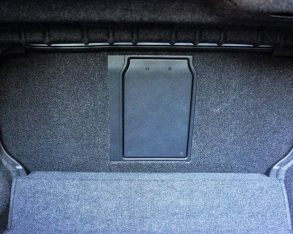 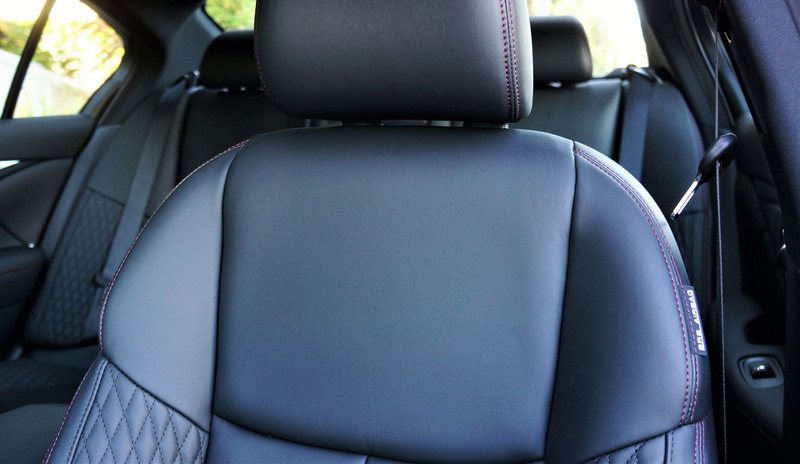 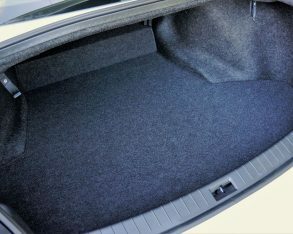 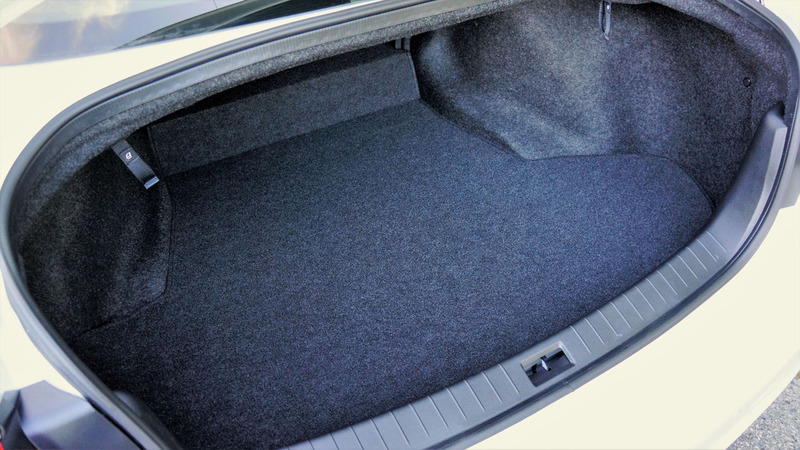 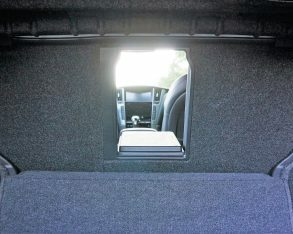 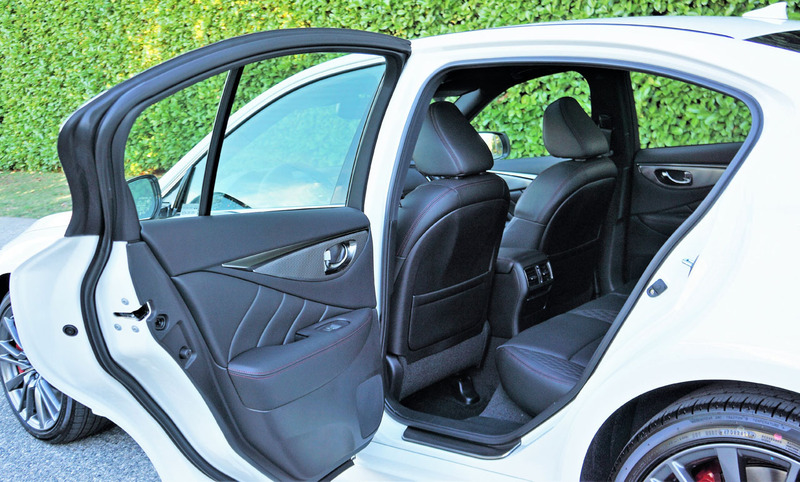 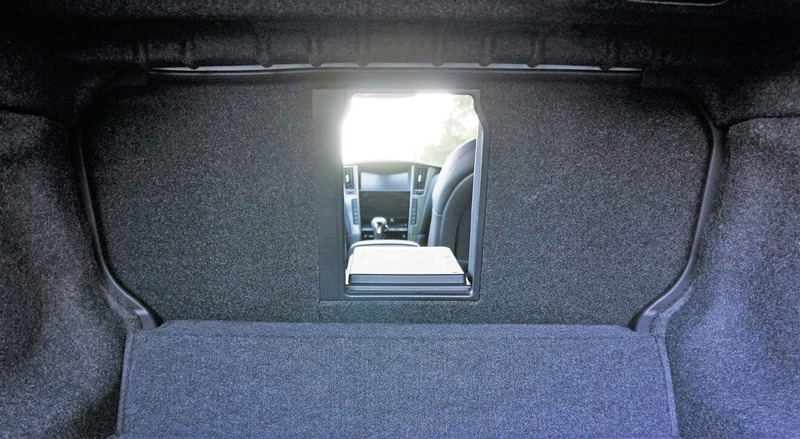 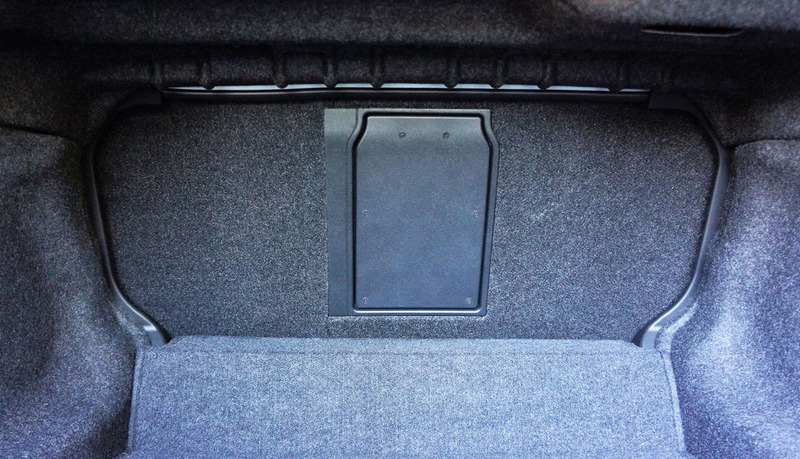 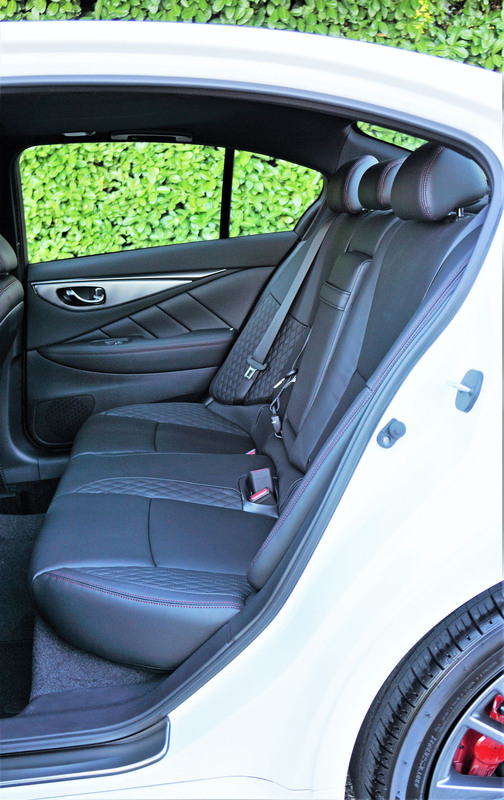 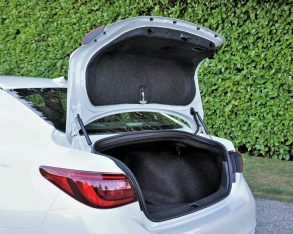 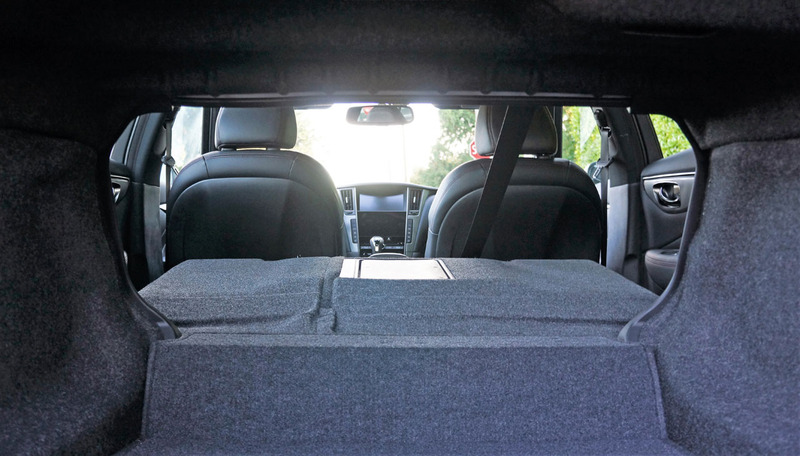 The lower cushions of both front seats extend as well, while the driver’s torso bolsters can be powered in and out for additional lateral support. 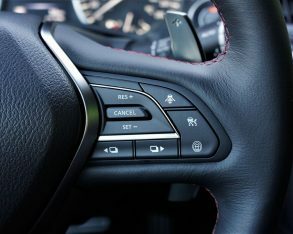 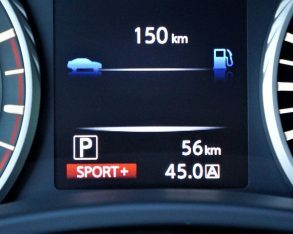 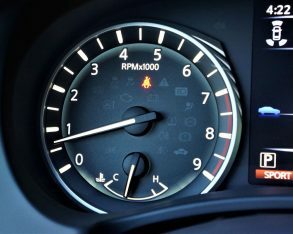 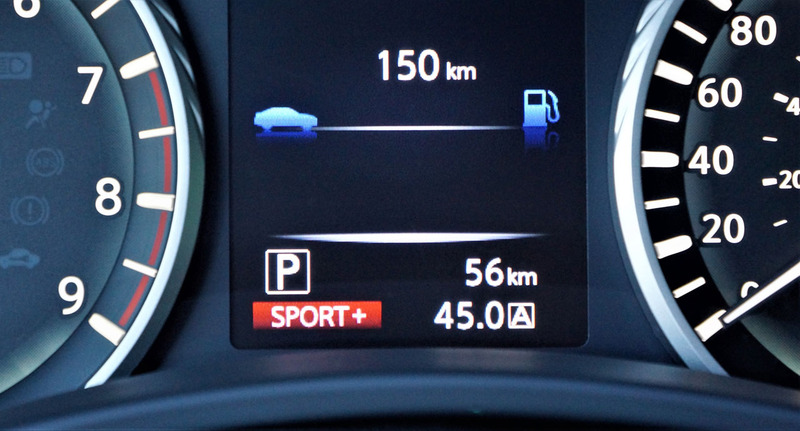 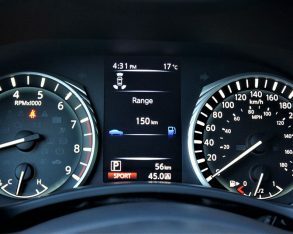 Lastly, the new Red Sport 400 gets unique dark chromed primary instrument bezels, although those fully infused into the digital age might feel the analogue gauges are a bit of a throwback when others in the class are offering fully configurable colour TFT instruments in their top-line trims. 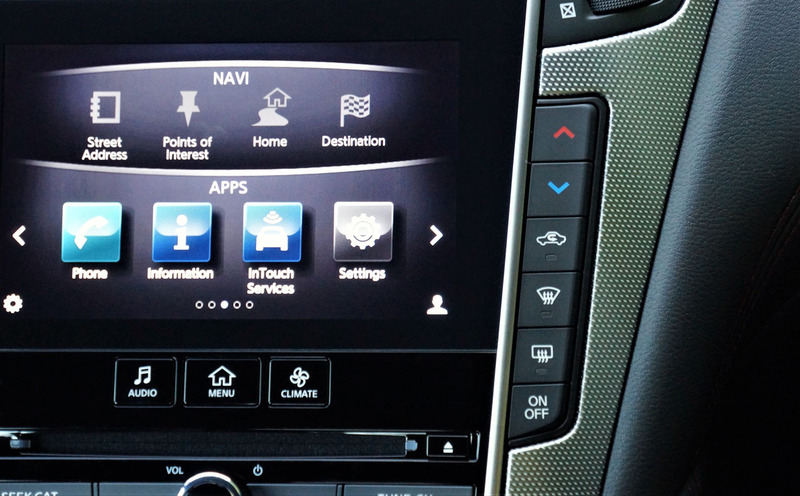 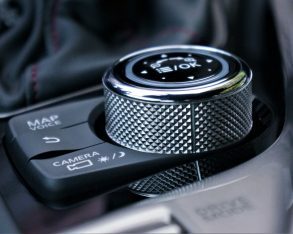 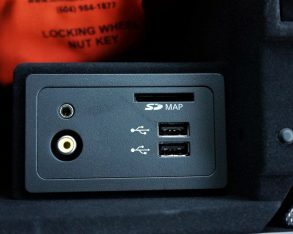 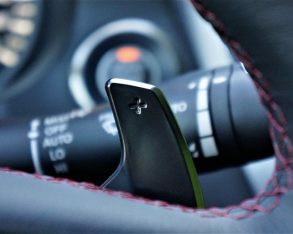 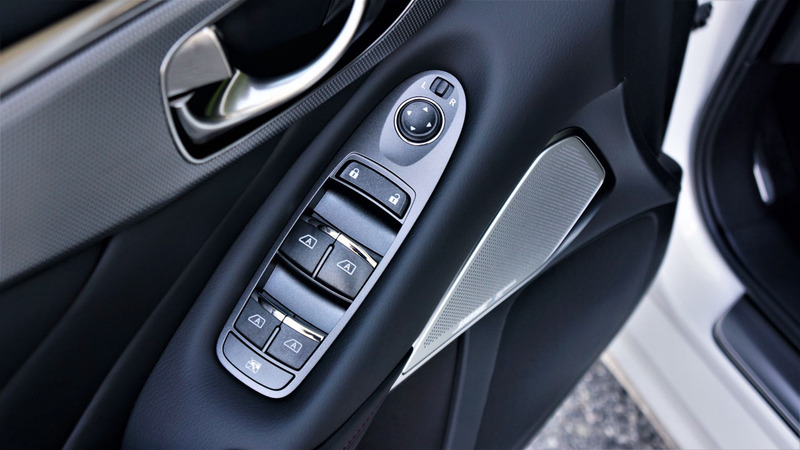 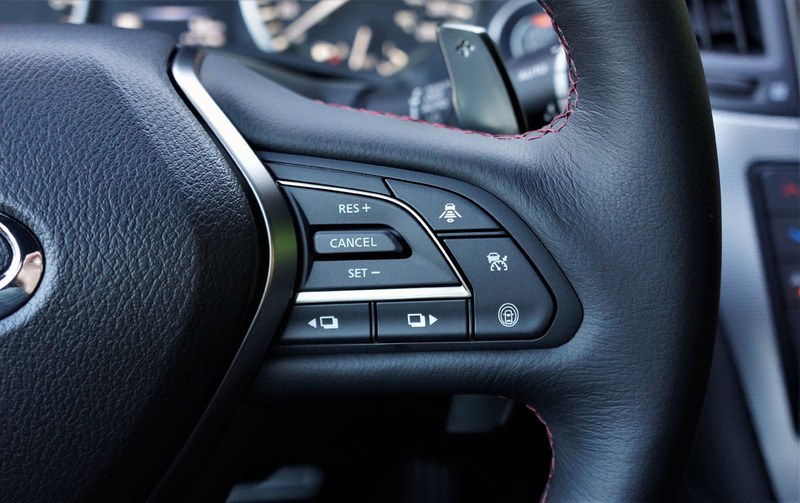 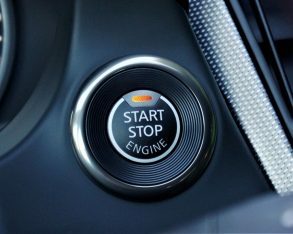 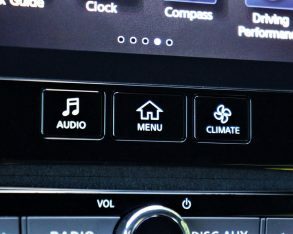 over from its German competitors when it comes to centre stack infotainment because it continues to use a duo of more familiar, tablet-style touch-capacitive interfaces instead of a rotating controller, button and/or touchpad design. 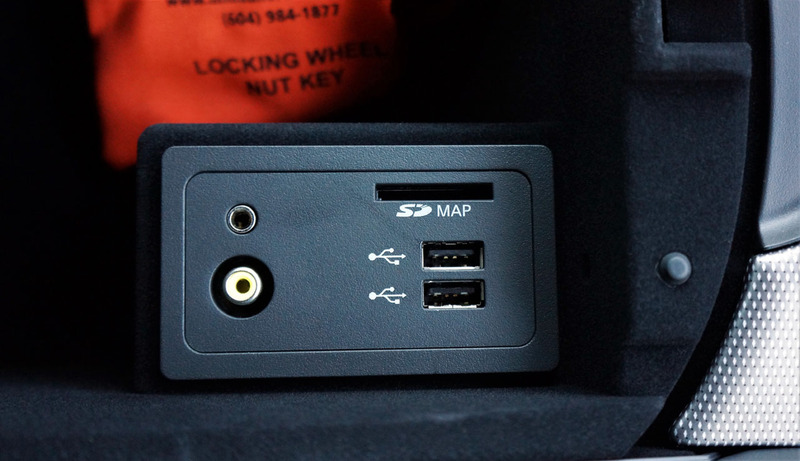 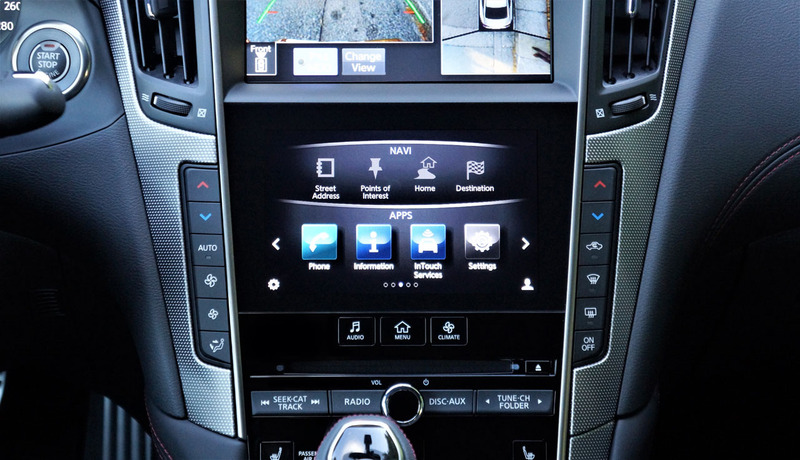 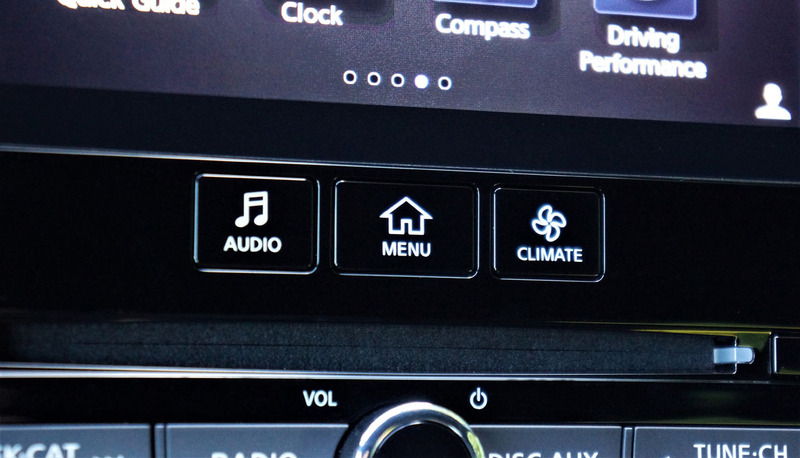 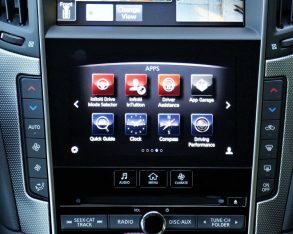 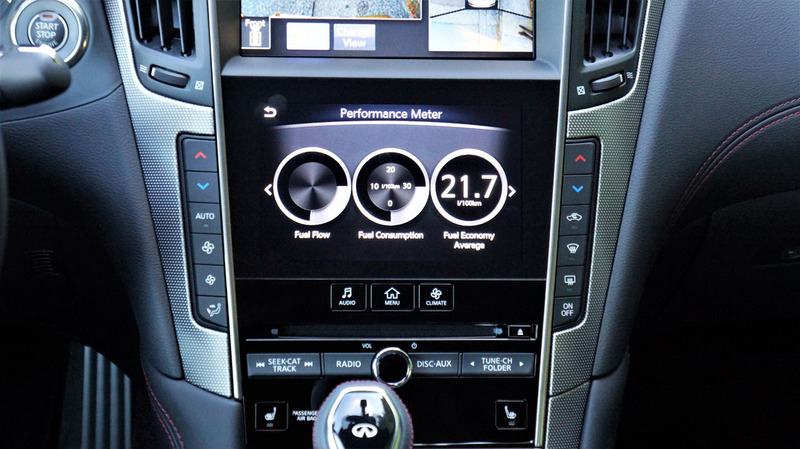 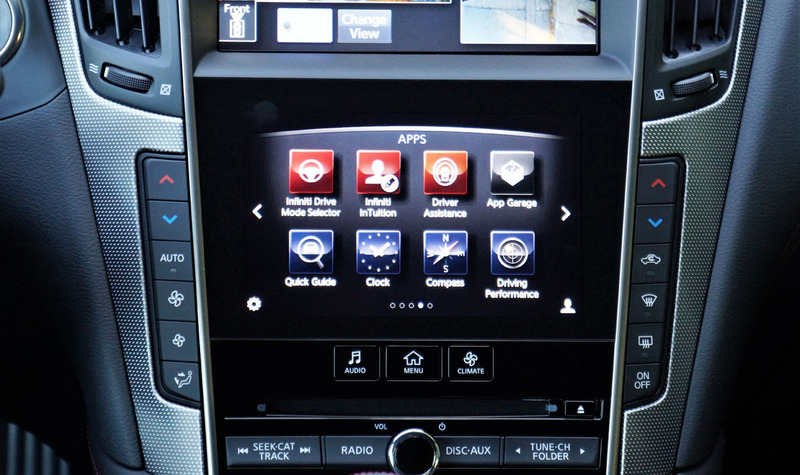 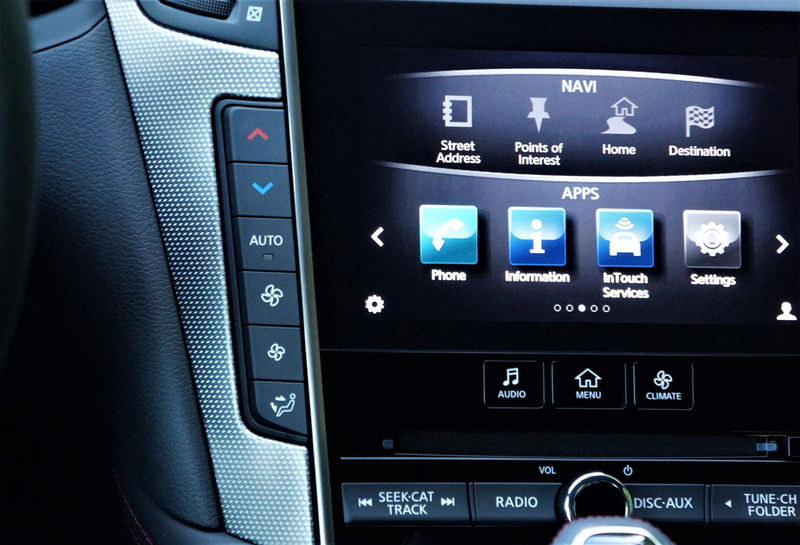 These vertically stacked displays allow the use of multiple functions simultaneously, such as navigation mapping on the top eight-inch screen and audio control for the bottom seven-inch one. 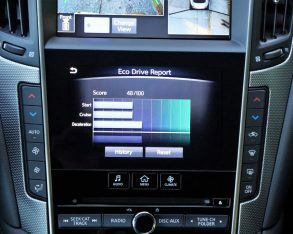 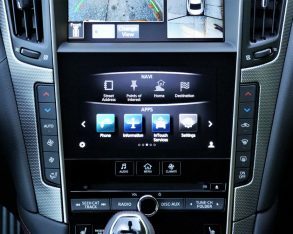 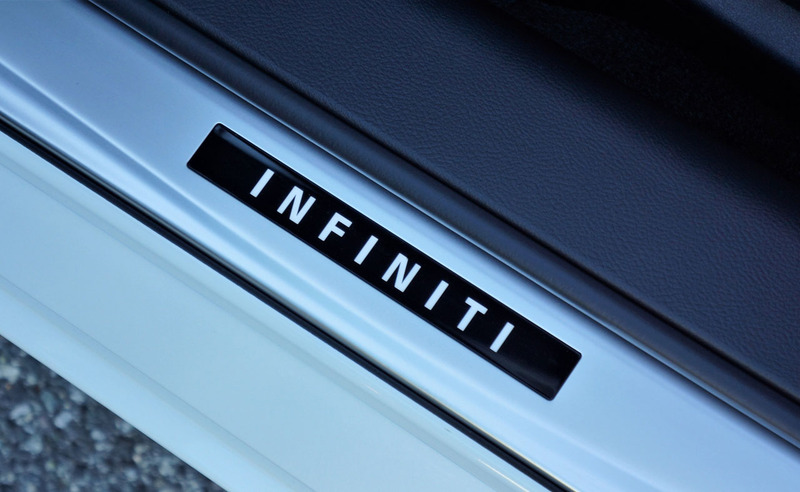 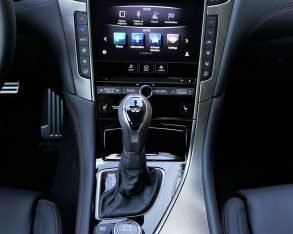 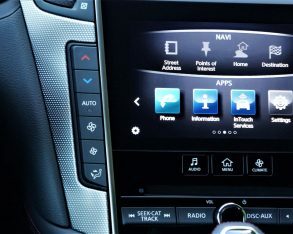 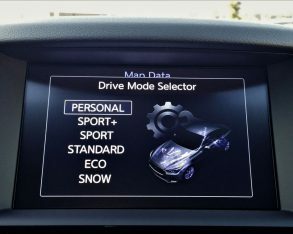 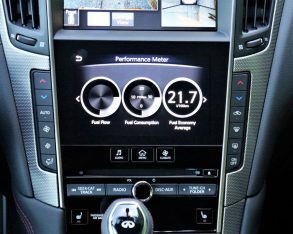 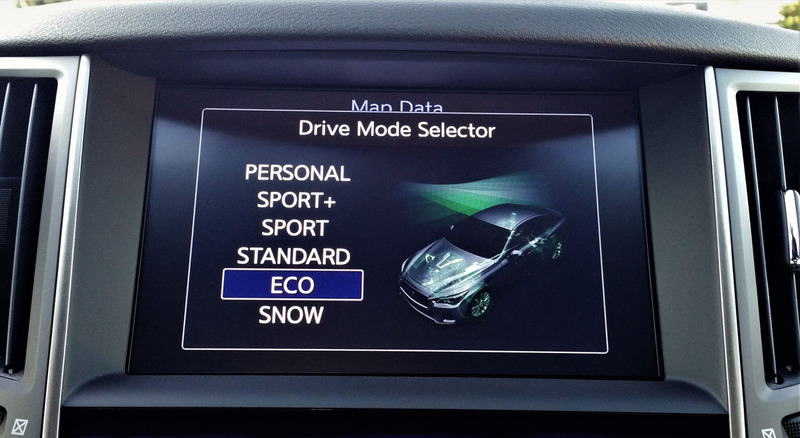 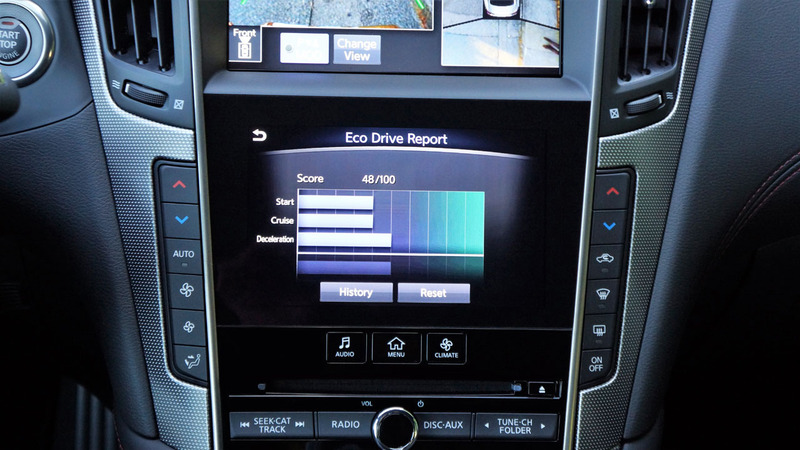 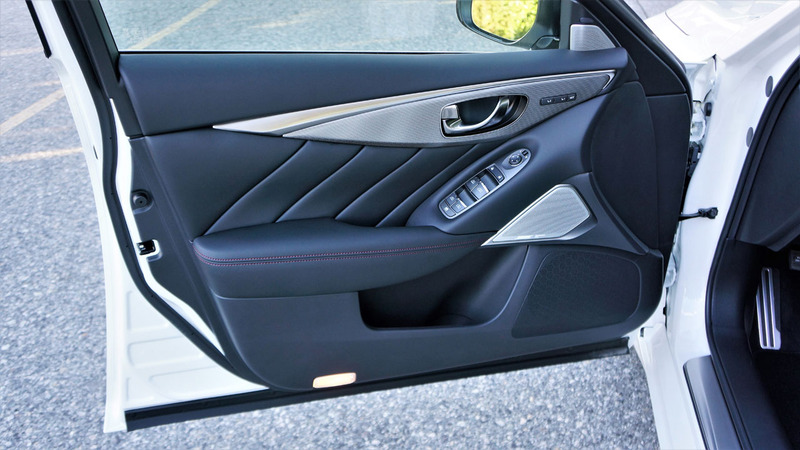 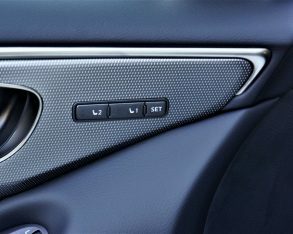 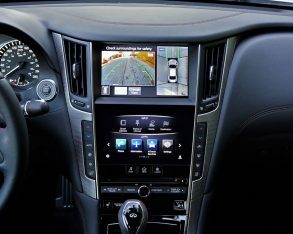 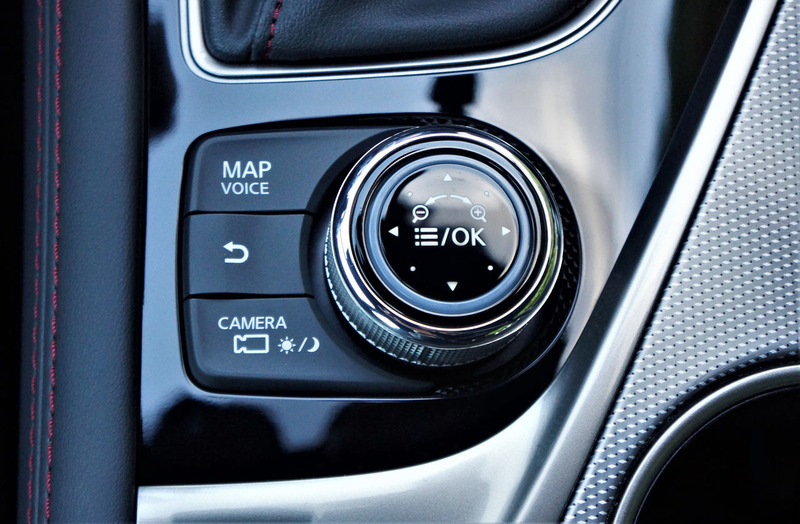 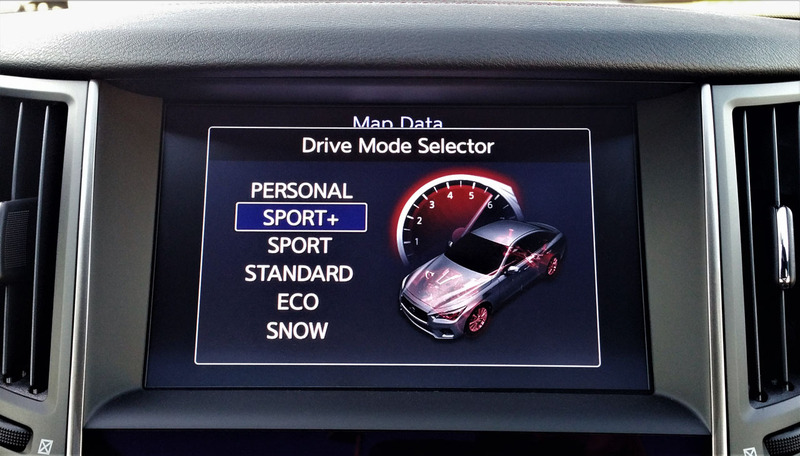 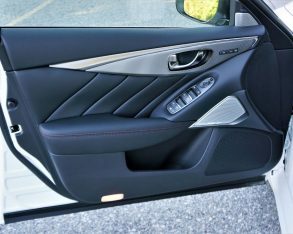 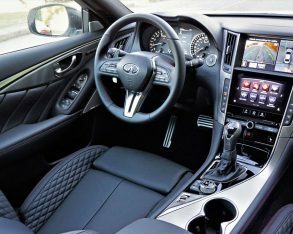 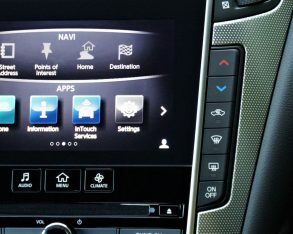 Infiniti’s appropriately named InTouch infotainment system also lets its various drivers customize the car’s inner environment by storing detailed personal information for multiple users, such as memory seating and mirror positions, identifiable via individual proximity-sensing I-keys. 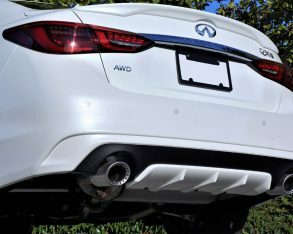 Series” audio system, standard in the Red Sport 400, featuring advanced staging signal processing capable of “a precise, rich and nuanced acoustic experience,” said Infiniti in their initial press release, plus CenterPoint 2.0 surround-sound. 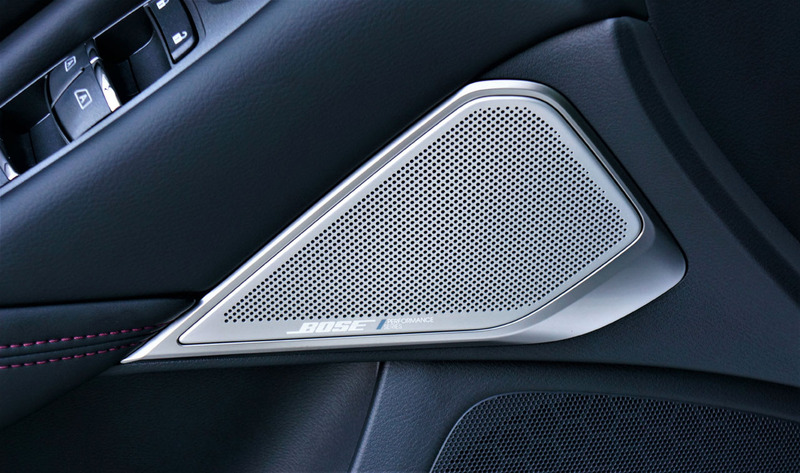 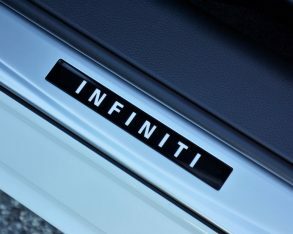 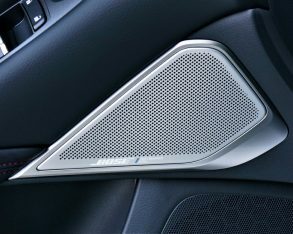 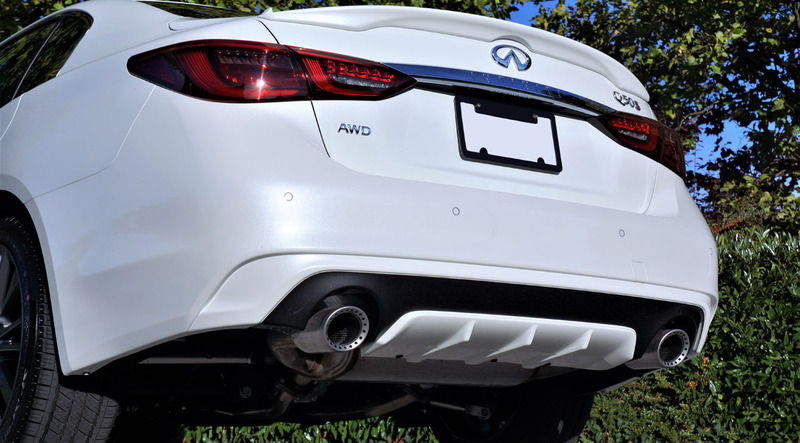 I have to agree with Infiniti, as the sound quality is superb. 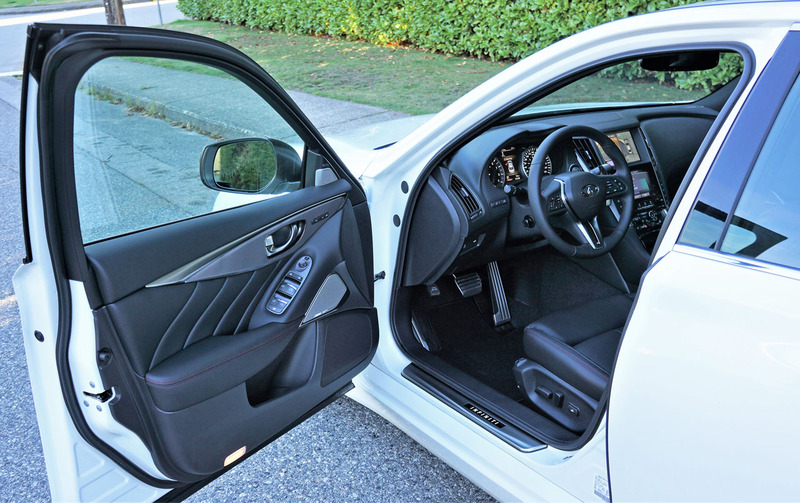 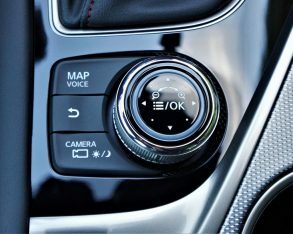 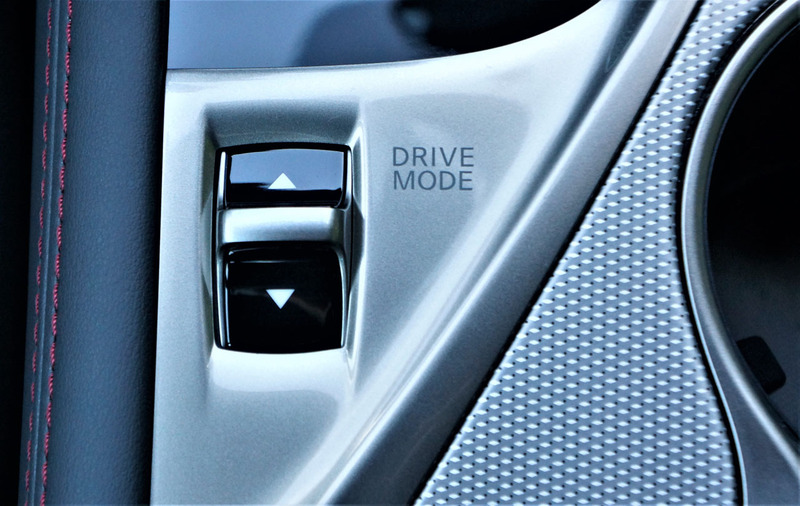 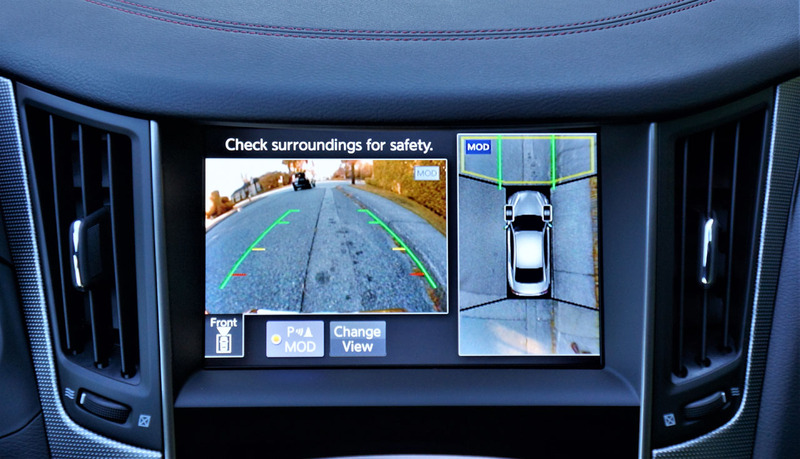 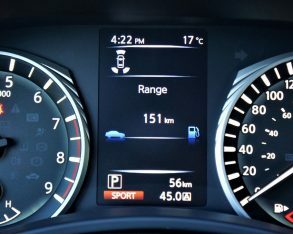 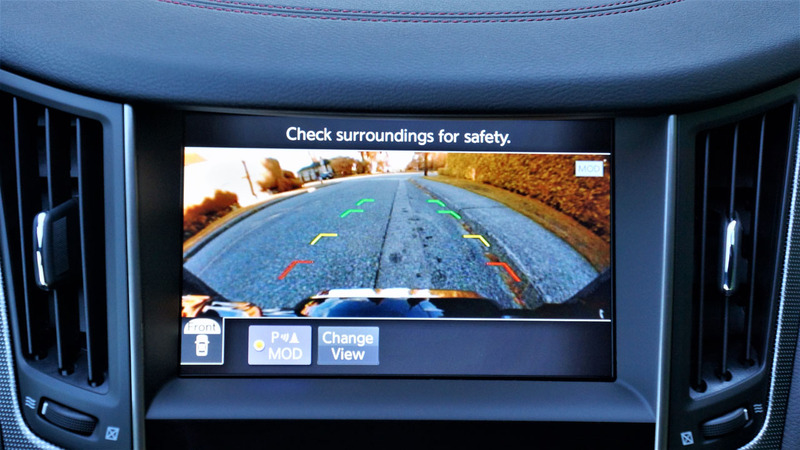 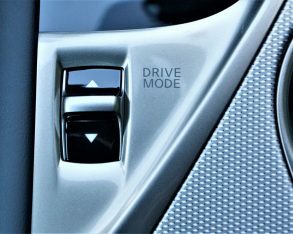 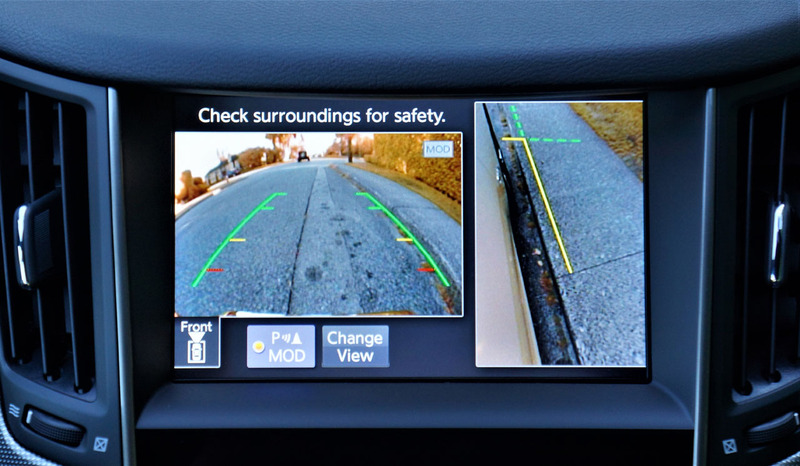 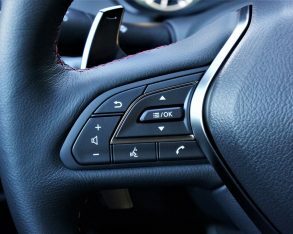 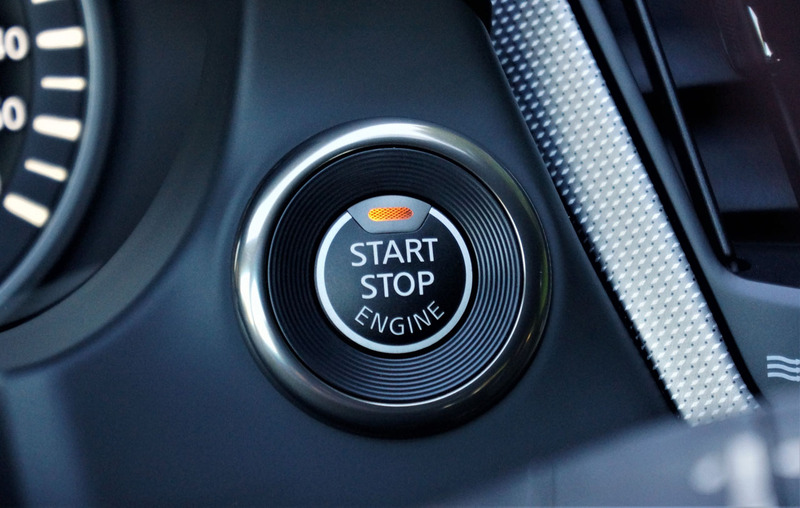 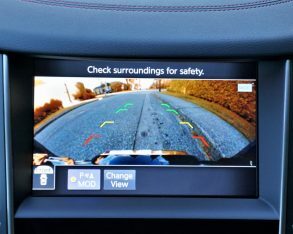 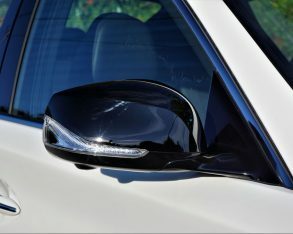 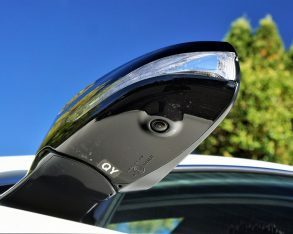 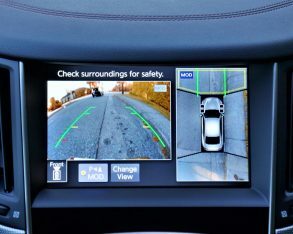 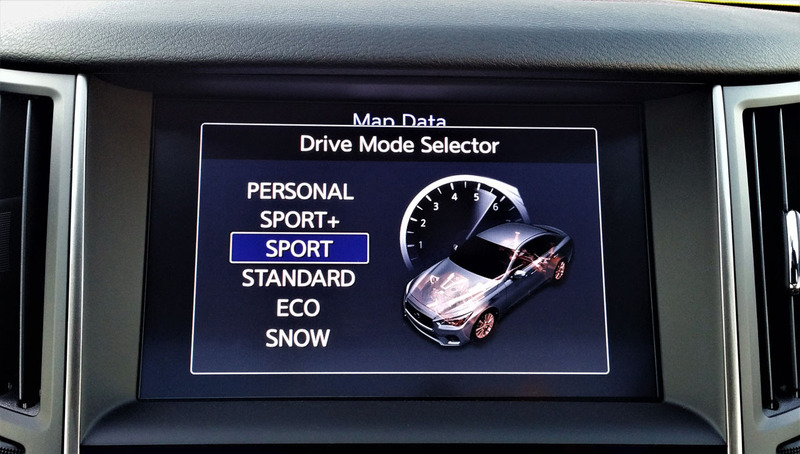 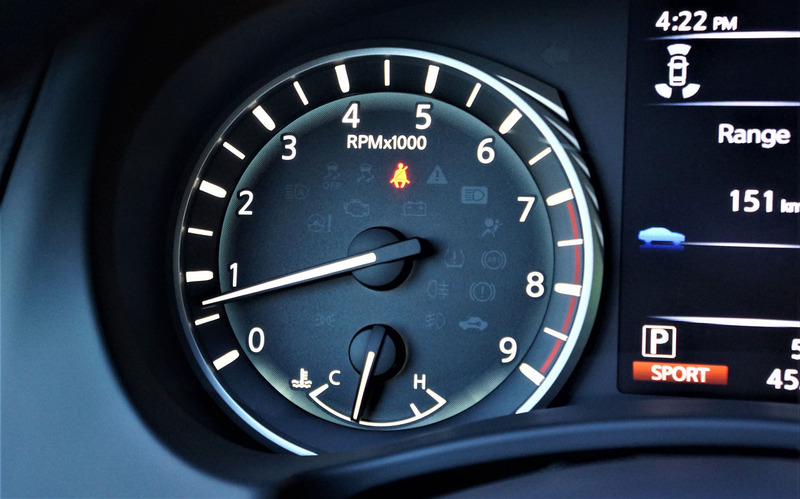 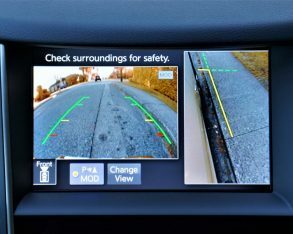 Possibly the biggest 2018 Q50 news is its available suite of ProPILOT advanced driver-assistance systems, which include Active Lane Control (camera-sighted autonomous driving capability above 72 km/h or 45 mph), Intelligent Cruise Control, Distance Control Assist, Backup Collision Intervention, Blind Spot Warning and Intervention, Lane Departure Warning and Prevention, Forward Emergency Braking, Predictive Forward Collision Warning, and last but hardly least, Infiniti’s exclusive Direct Adaptive Steering. 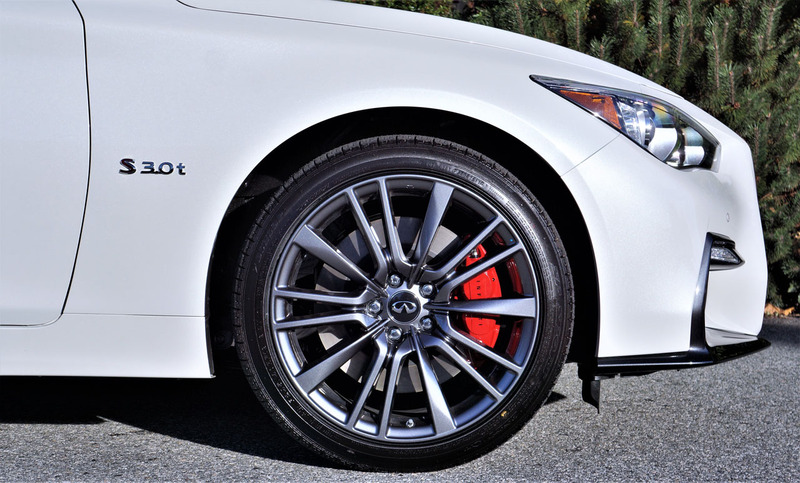 a million kilometres (625,000 miles) of tests on the second-gen Direct Adaptive Steering system alone. 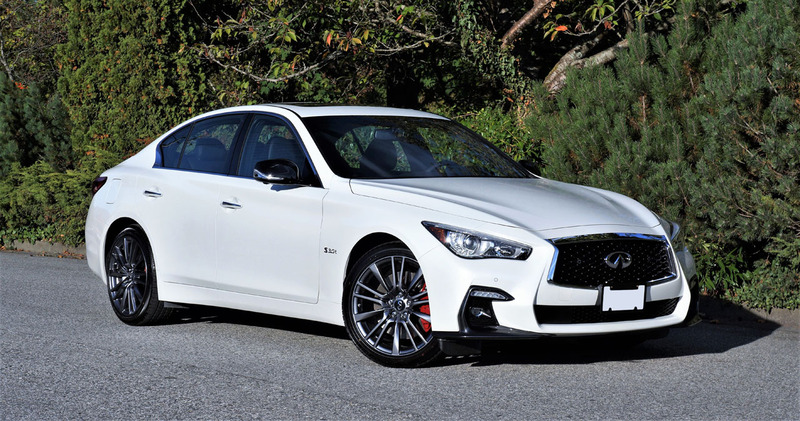 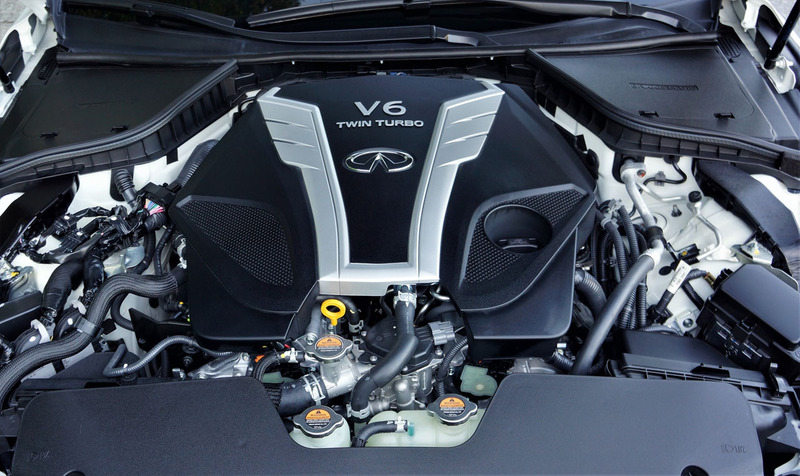 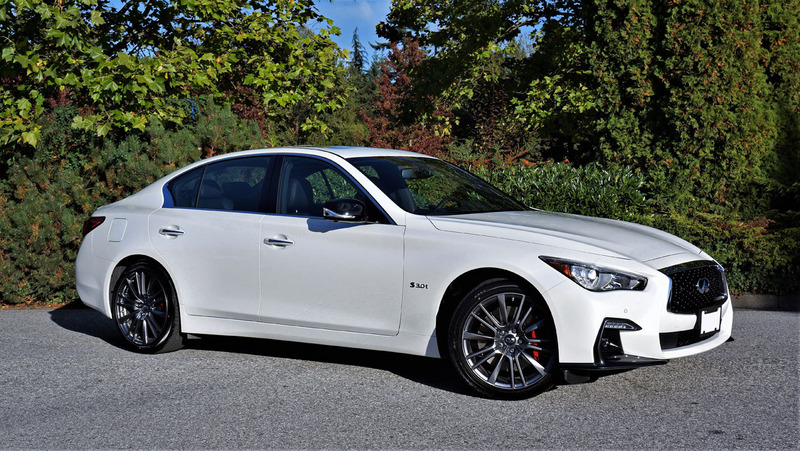 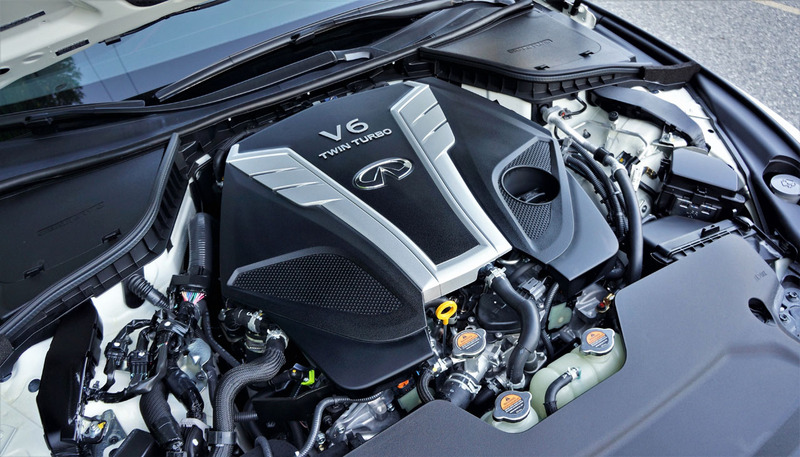 The 2018 Q50’s three powertrains (one of which comes in two states of tune) are all carryover, although this shouldn’t come as a surprise as they were just updated for the 2016 model year. 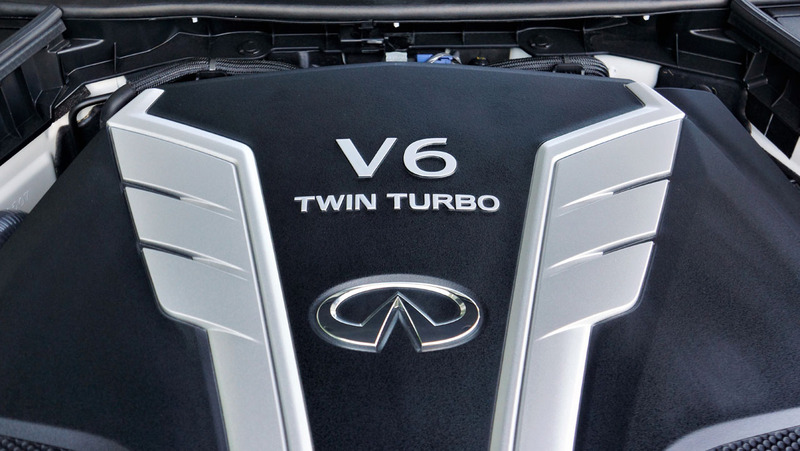 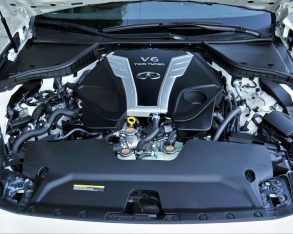 Included is the base 2.0t, a Mercedes-sourced 208 horsepower 2.0-litre four-cylinder featuring 258 lb-ft of torque that gets mated to Infiniti’s in-house seven-speed automatic and all-wheel drive, the latter two components also standard with the other two conventional engine choices. 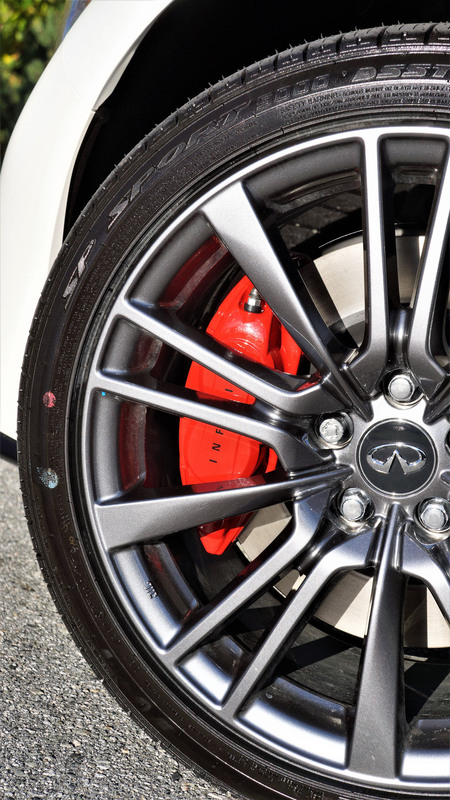 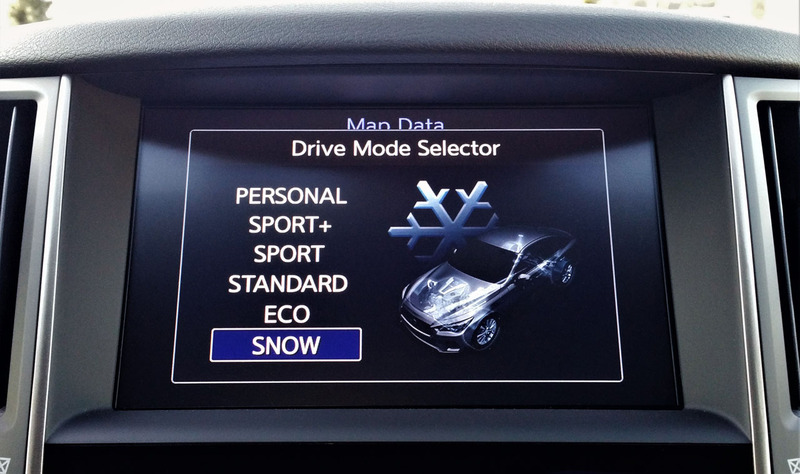 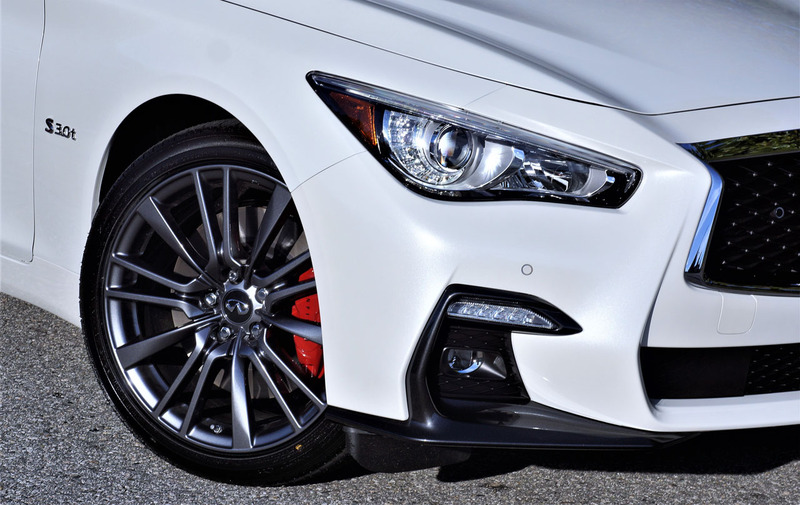 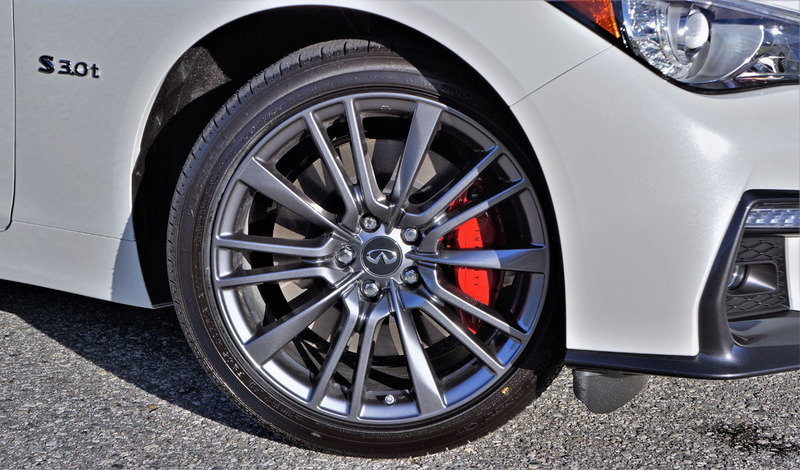 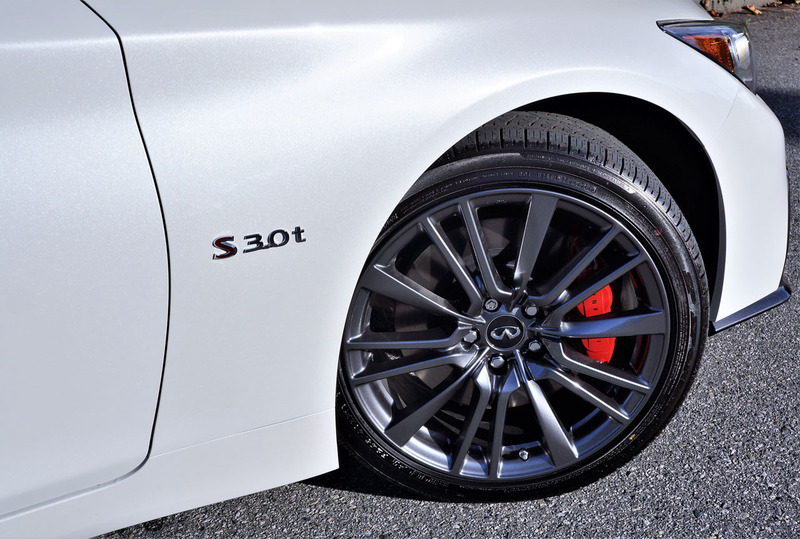 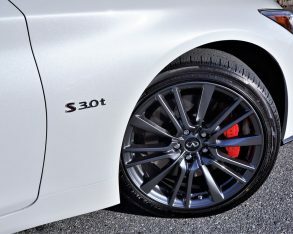 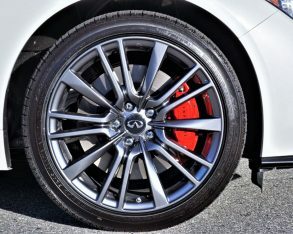 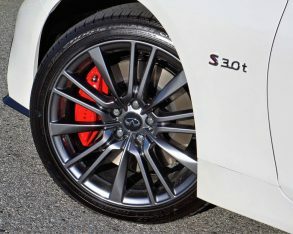 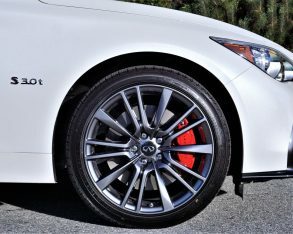 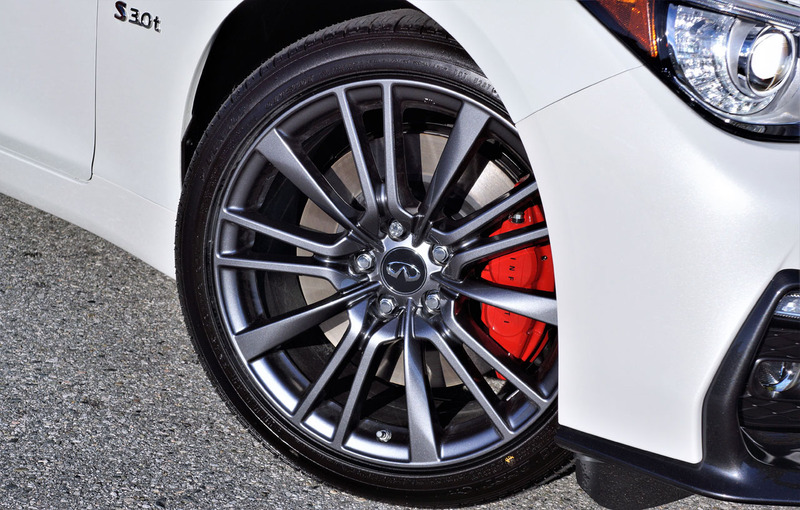 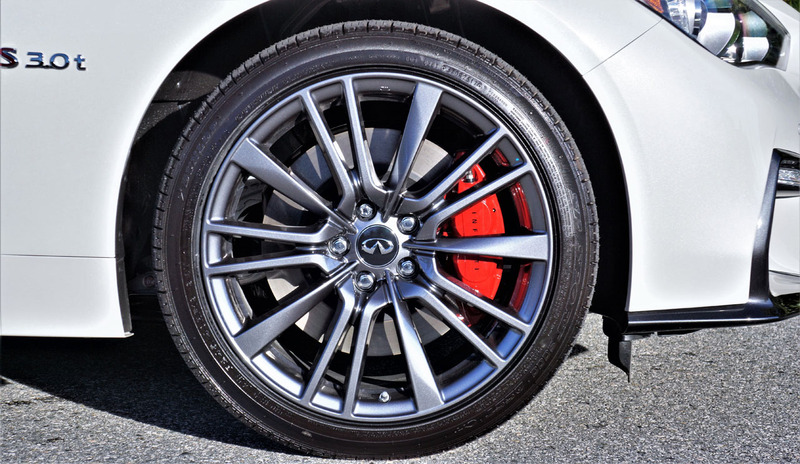 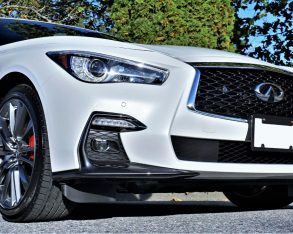 the Q50’s AWD system has long been lauded for its rear-wheel biased response and feel in high-grip conditions, which aids performance, while the quick-shifting seven-speed auto remains one of the most advanced of its type in the industry due to dual transmission fluid coolers, Adaptive Shift Control (ASC) boasting an adaptive learning algorithm that senses a driver’s style and automatically adjusts shifting accordingly (upgraded with navigation-synchronized capability in upper trims), as well as a manual shift mode that makes you drive and sound like a pro thanks to Downshift Rev Matching (DRM). 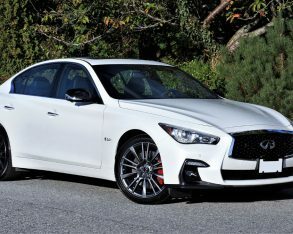 powerplant is good for 300 horsepower and 295 lb-ft of torque, which will be more than adequate for most, but the top-line Red Sport 400 being reviewed here pushes out a shocking 400 horsepower and 350 lb-ft of torque. 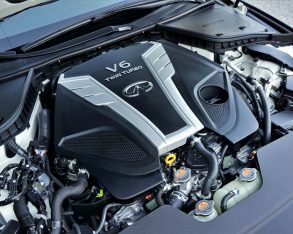 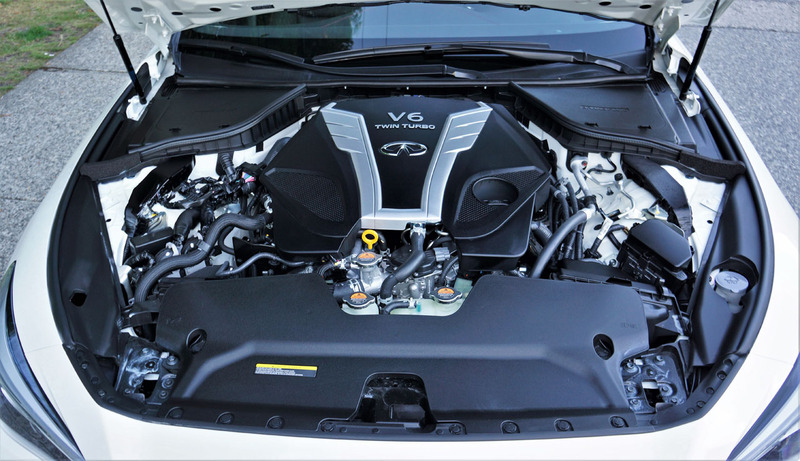 Before I delve into how that powertrain feels when hooked up to the refreshed Q50, I need to tell you that Infiniti’s high-energy Direct Response Hybrid powertrain continues into 2018 too. 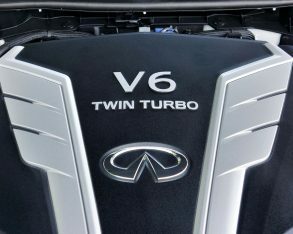 This power unit consists of the brand’s old 3.5-litre V6, plus a 50-kW electric motor, and a compact laminated lithium-ion battery. 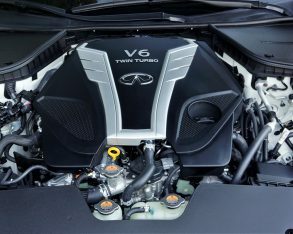 The combination makes a net 360 horsepower due to the internal combustion engine’s 302 horsepower and electric motor’s 67 horsepower (hybrid net output never adds up exactly), plus a non-advertised sum of torque, although the ICE’s 258 lb-ft and electric motor’s 213 lb-ft makes for a potent mixture. 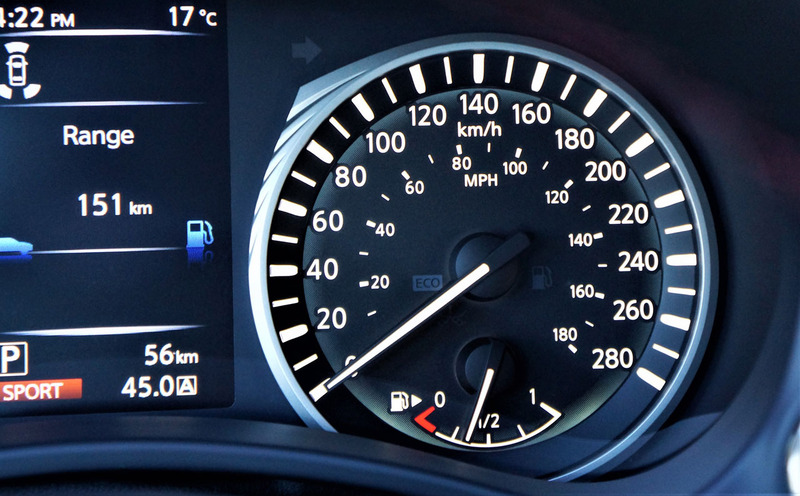 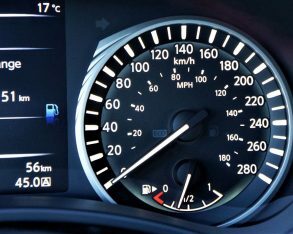 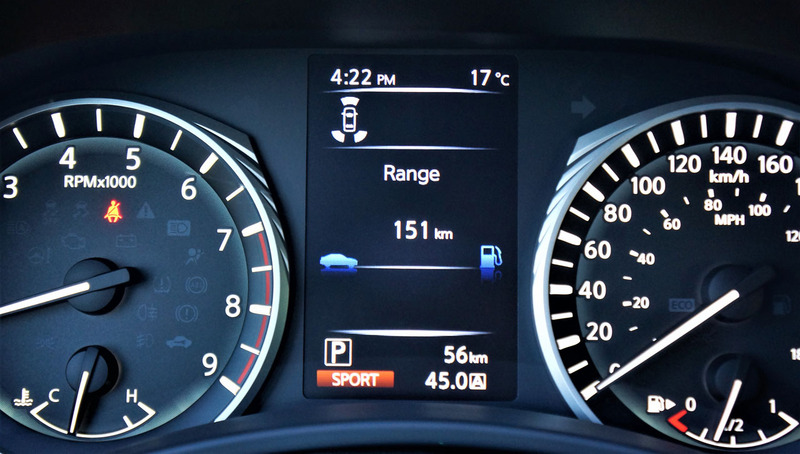 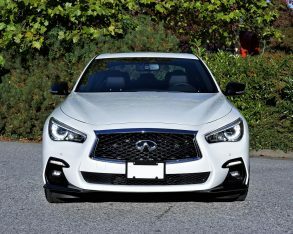 year’s Q50 Hybrid was good for a claimed 9.1 L/100km city, 7.7 highway and 8.5 combined, which made it quite thrifty considering the performance on tap, while the 2017 Q50 2.0t was estimated to achieve 10.7 L/100km city, 8.4 highway and 9.6 combined, thanks partially to fuel-saving stop/start technology. 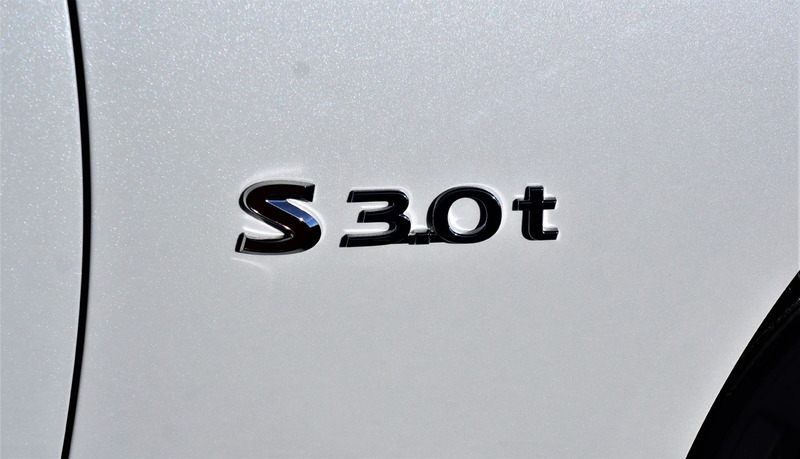 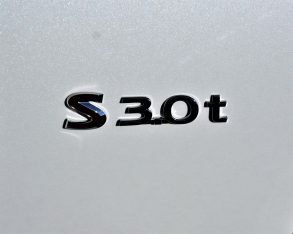 Additionally, the mid-range 3.0t achieved a rating of 12.6 city, 8.8 highway and 10.9 combined, while the top-tier Red Sport 400 earned an estimated 12.3 city, 9.2 highway and 10.9 combined, its city mileage strangely more efficient than the less formidable engine. 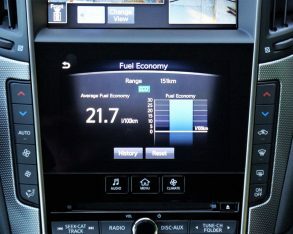 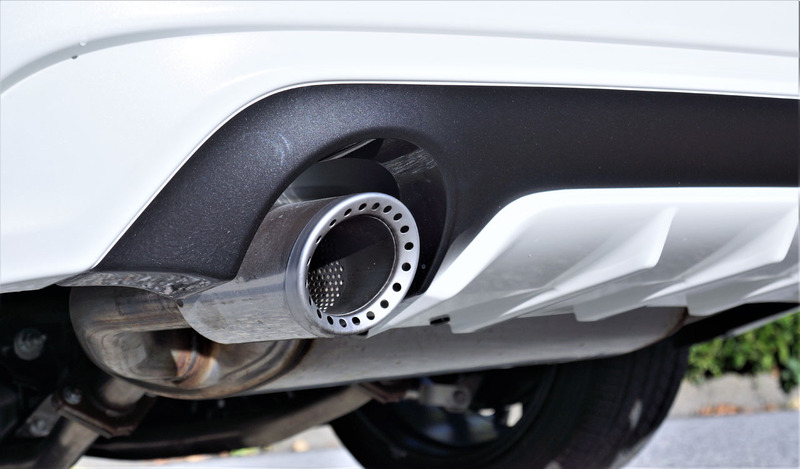 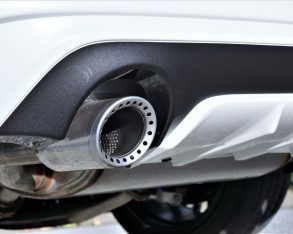 We’ll have to wait to see if the new 2018 model’s Transport Canada ratings do as well or possibly surpass the outgoing estimates when they’re made available, being that the reshaped body shell’s overall aerodynamics and its numerous unique design details are capable of literally causing turmoil with fuel economy figures. 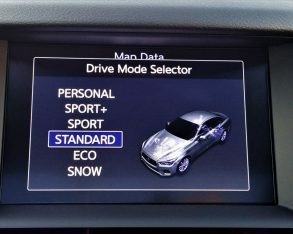 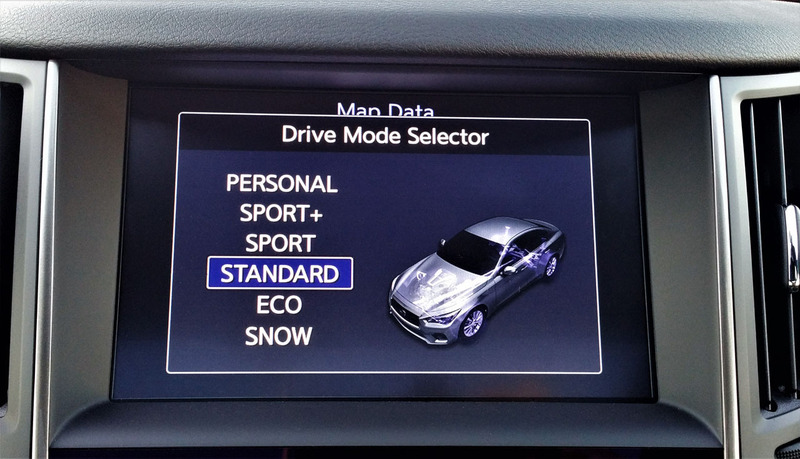 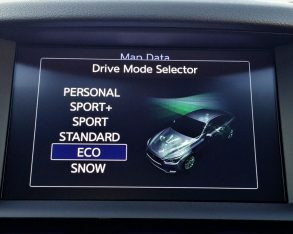 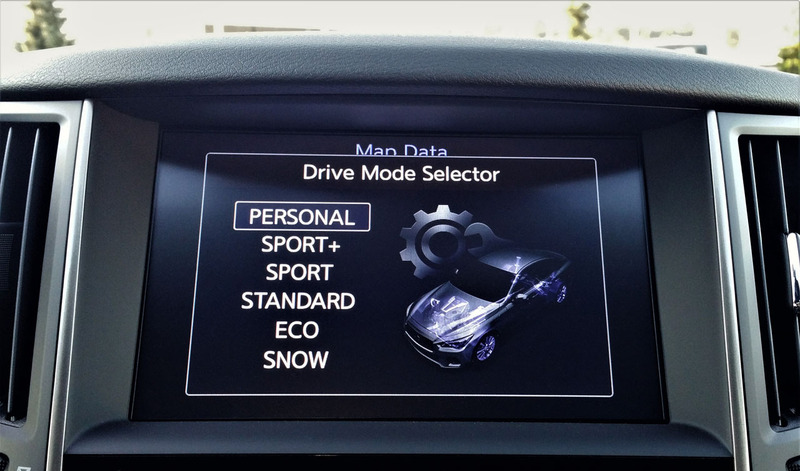 note, Q50s fitted with the larger engine will get Infiniti’s refined “Rack Electronic Power Steering” as standard, which can also be modulated via the aforementioned Drive Mode Selector, while 2.0-litre Q50 models are equipped with more conventional vehicle speed-sensitive hydraulic electronic rack-and-pinion power steering. 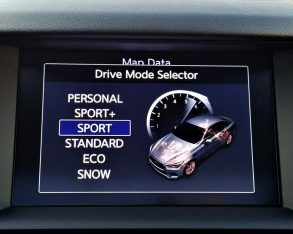 up the electronically adjustable dampers via the previously noted Sport or Sport+ modes when pushing hard, at which point the suspension constantly adjusts for optimal handling and ride quality. 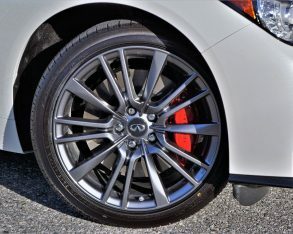 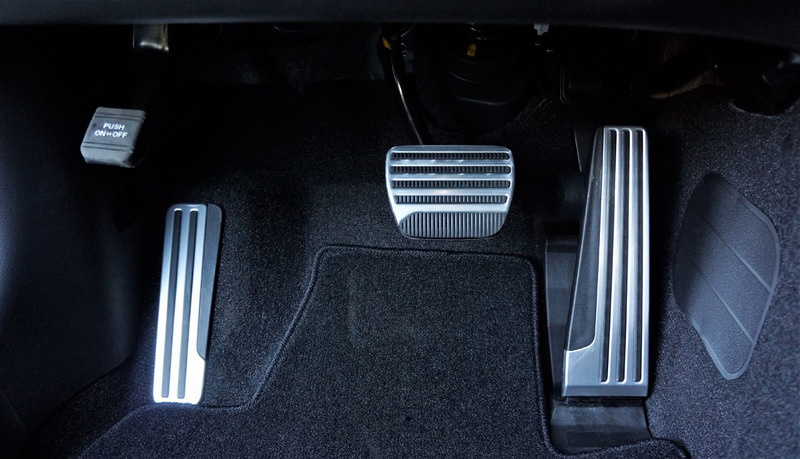 accelerates beyond posted limits, its upsized four-piston caliper enhanced front brakes and two-piston rears more than adequate for scrubbing off that speed when called upon. 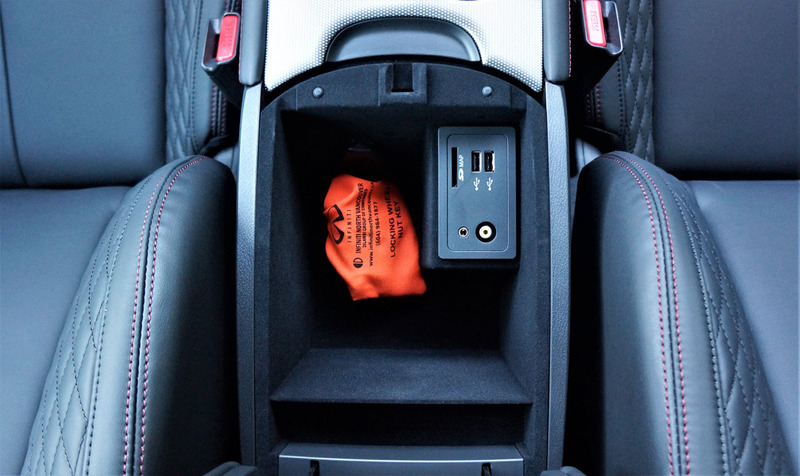 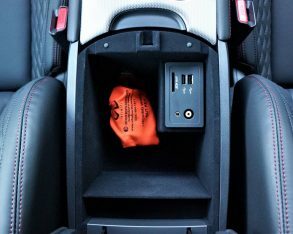 pliable plastics, albeit once again the glove box lid gets a dose of the good stuff for a nice upscale feel. 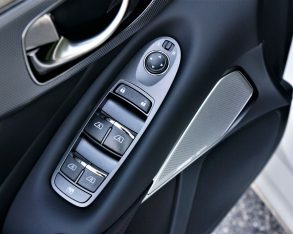 Likewise, all of the switchgear is superb. 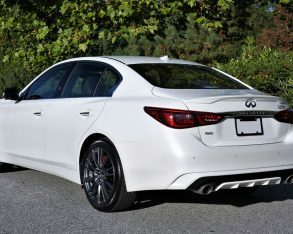 rearview mirror, a garage door opener, a powered moonroof, genuine maple inlays, Scratch Shield exterior paint, and much more, while Luxe trim with the 3.0-litre V6 adds remote engine start, navigation, lane guidance, 3D building graphics, Infiniti’s InTouch Services, SiriusXM real-time traffic info, 60/40 split-folding rear seats with a flip-down centre armrest and handy centre pass-through, and more for $44,995. 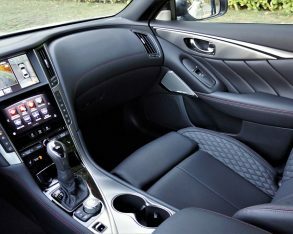 performance upgrades as well as a powered steering column, driver’s memory for the seat, side mirrors and steering wheel, aluminum pedals, auto-dimming side mirrors with reverse tilt-down, adaptive cruise control, advanced climate control with auto-recirculation, plasmacluster air purification and grape polyphenol filtration, 16-speaker Bose audio, quilted semi-aniline leather upholstery, the aforementioned dark metal trim, and more. 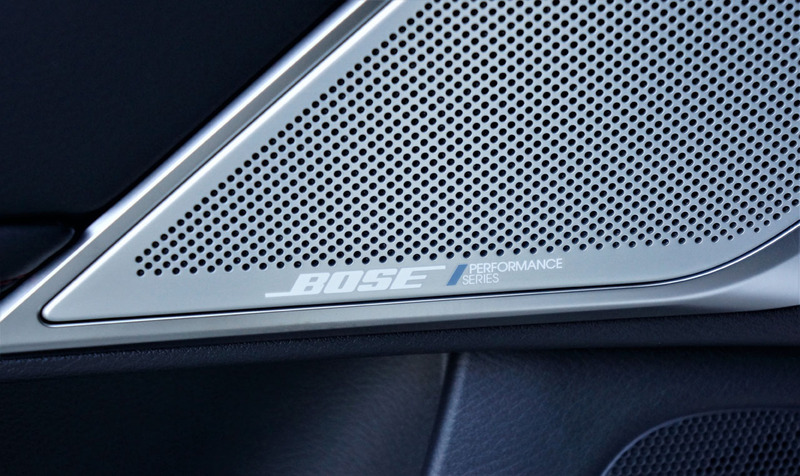 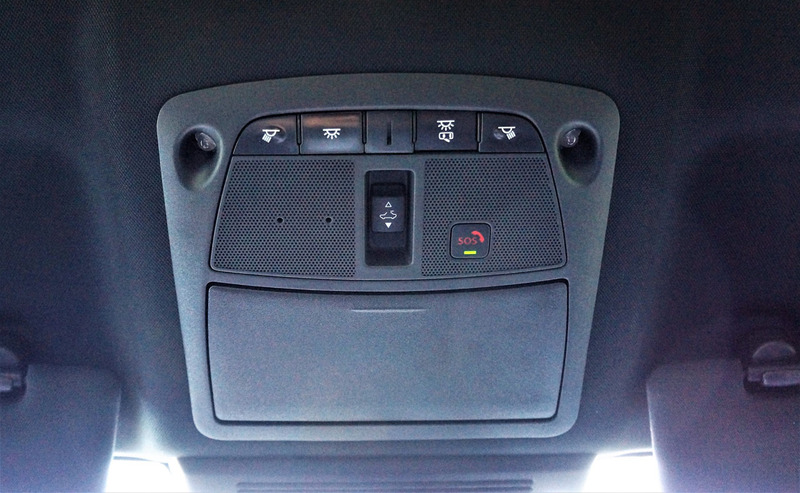 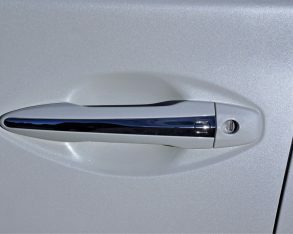 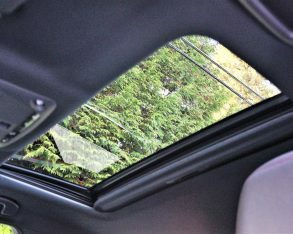 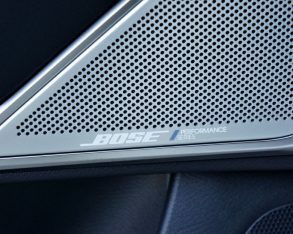 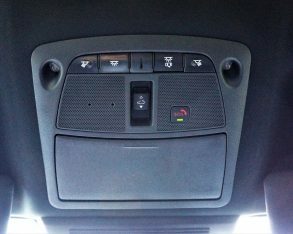 and grape polyphenol filtration, or 16-speaker Bose audio, although it does include the ProAssist package which adds front and rear parking sensors, a 360-degree Around View Monitor with Moving Object Detection, cross-traffic alert with backup collision intervention, blindspot monitoring, predictive forward collision warning (that can see two cars ahead), and forward emergency autonomous braking, but no auto high beams that are included in the Canadian-spec $2,000 ProAssist package. 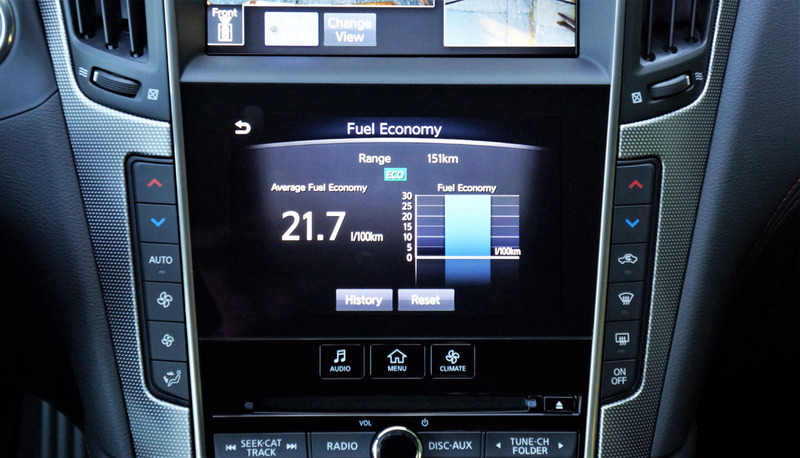 Still, the Canadian dollar equivalent of $53,000 USD is about $68,245 for way fewer features. 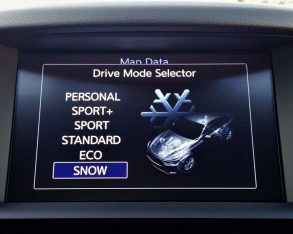 options packages, while my tester also included the just noted ProAssist package as well as the $3,800 ProActive packaged, which added auto-leveling and adaptive cornering headlamps, distance control assist, lane departure warning, lane departure prevention with active lane control, blindspot intervention, front pre-crash seatbelts, and Infiniti’s Eco Pedal that forcefully pushes back on the throttle when it believes you’re being too aggressive, and by so doing causes those who might otherwise use Eco mode to cease and desist-if you can’t tell I don’t like it. 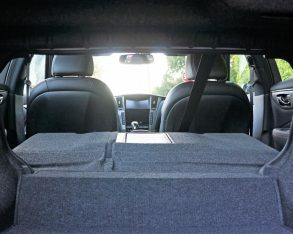 loaded example (except for $750 metallic paint) was just $58,495, before adding freight and dealer fees. 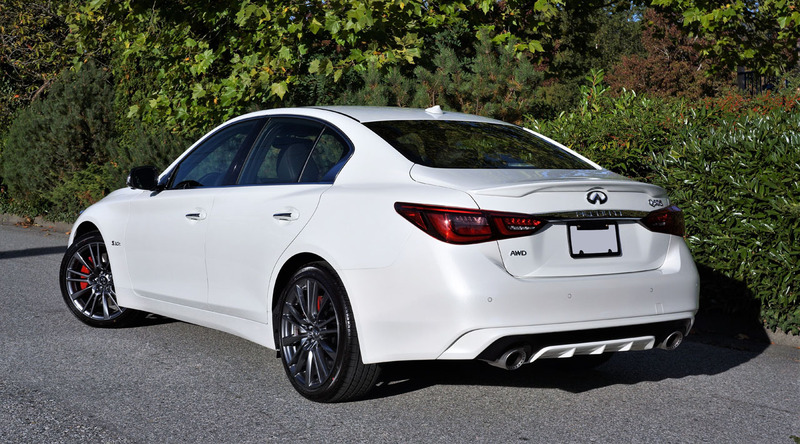 That’s better than $17k in savings from Infiniti Canada, before even asking for a discount. 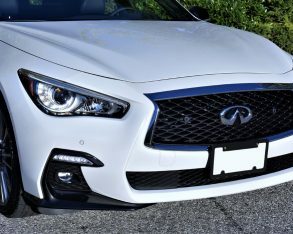 Canadian competitors offer better deals in Canada than the U.S. too, but the discounts aren’t as generous. 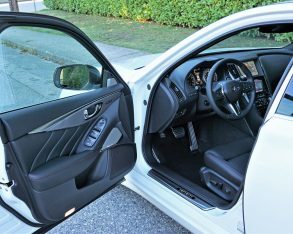 For instance, a fully-loaded albeit not as well equipped and less powerful BMW 340i xDrive costs close to $71k here, whereas the same vehicle in U.S-spec is the equivalent of about $78k after currency exchange. 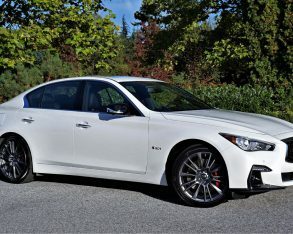 Of course, even without the U.S. pricing comparo it’s easy which car is the better deal. 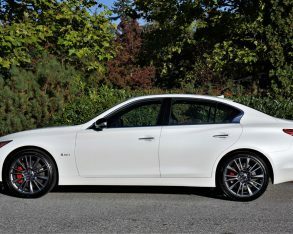 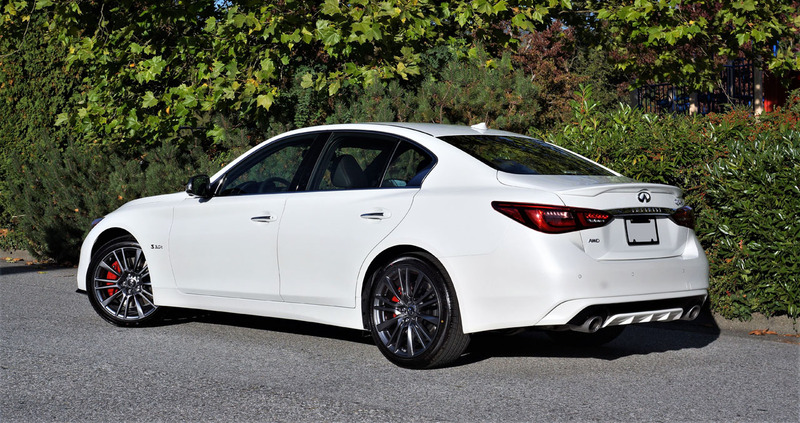 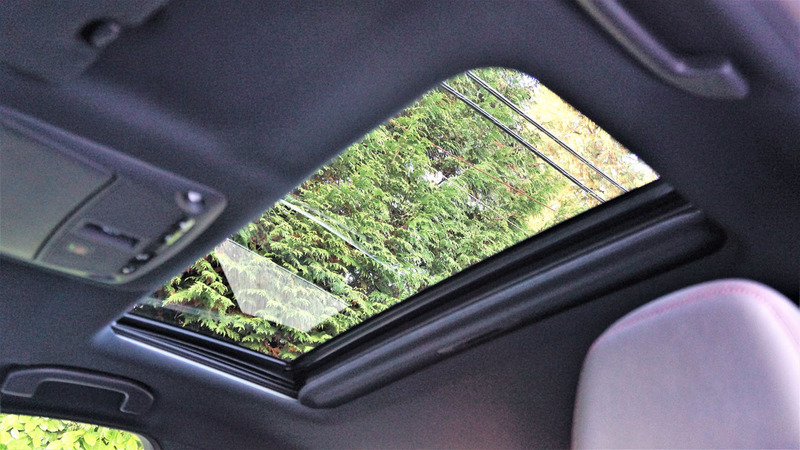 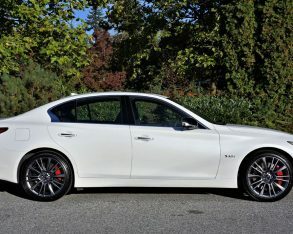 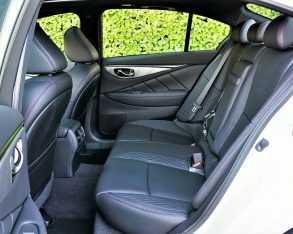 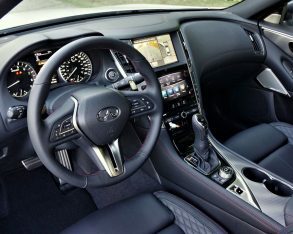 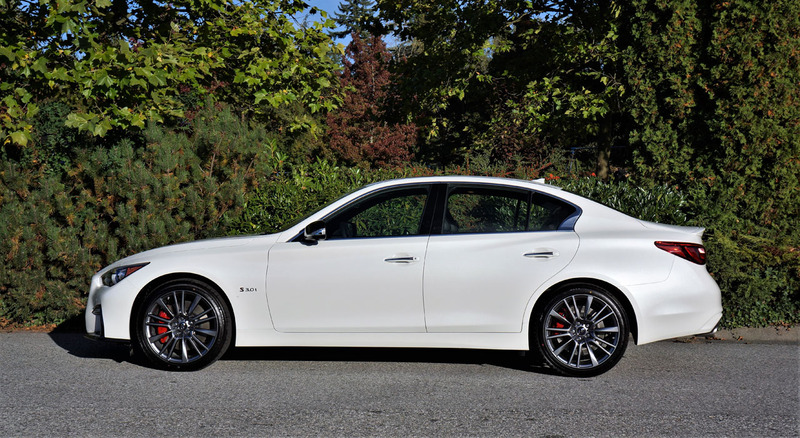 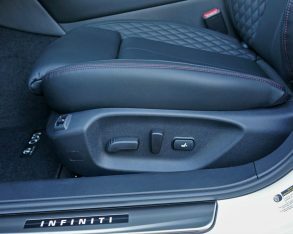 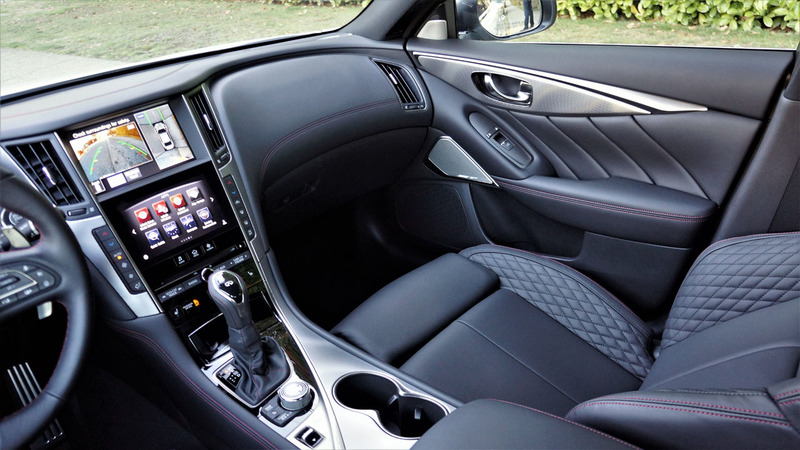 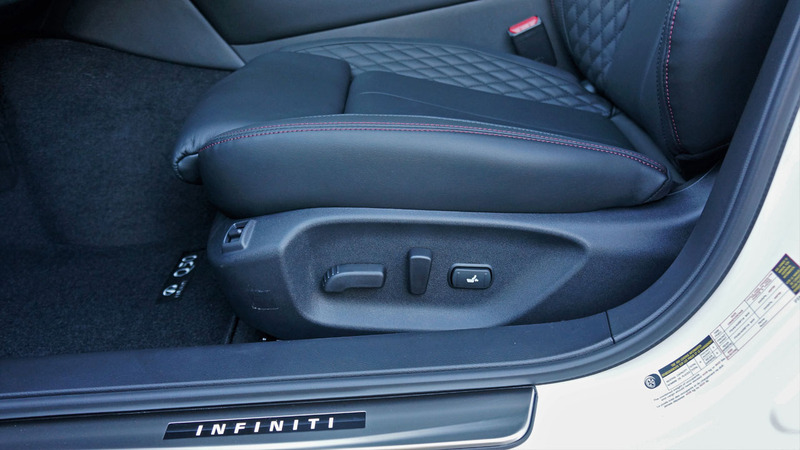 From its beautifully sculpted outward design and superbly crafted, wonderfully accommodating interior, to its extremely well balanced comfort and performance dynamics, the 2018 Q50 moves Infiniti a solid step up the premium D-segment desirability ladder, especially in top-tier Red Sport 400 trim. 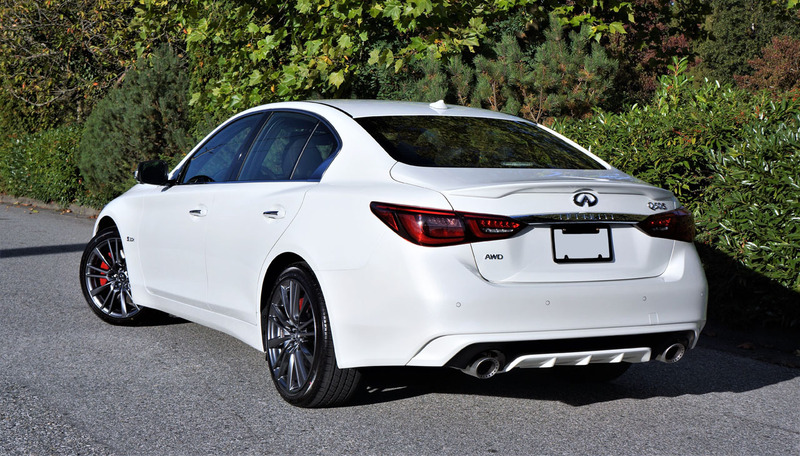 That it can be had for such exceptionally good value is a significant bonus. 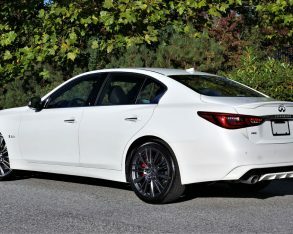 This in mind, it’s difficult not to recommend it.